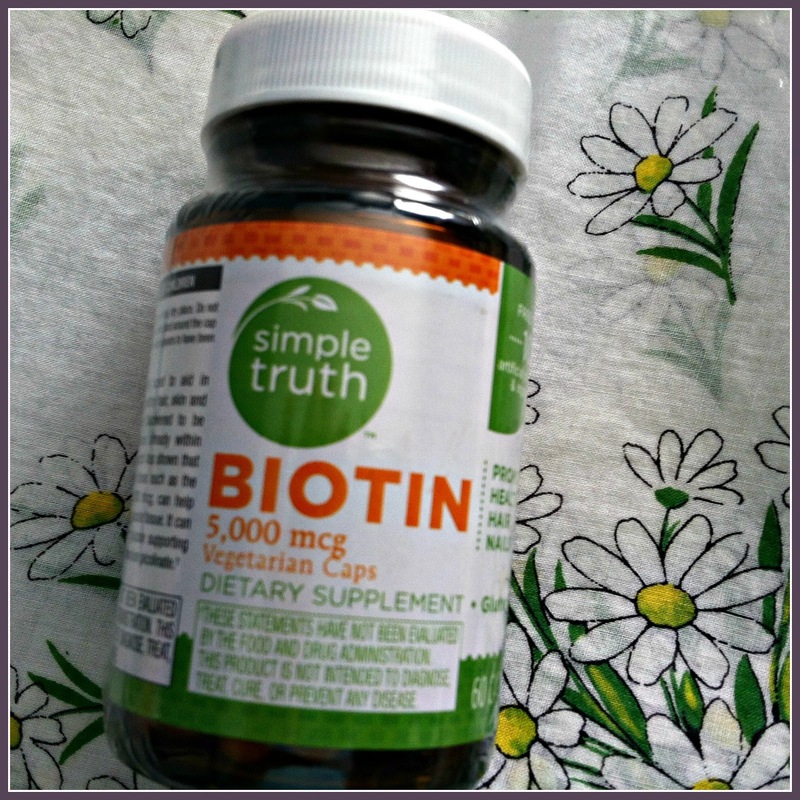 Let me introduce to you my new miracle pill -- Vitamin H, commonly known as biotin. It is actually a B vitamin (Vitamin B7 to be exact), so why is it known as Vitamin H? The H stands for haar und haut, German for hair and skin. It's miraculously restored my nails. I have had a split nail bed on my left thumb for about a year. Although I have always had problems with my nails breaking, peeling, and tearing, this split nail was a real problem. I kept it cut very short, but the edge of it was always catching on things, causing it to split down further. It was split down about 1/8 inch, which was significant since my nail bed is only 1/2 inch long. I was afraid it would tear further down, and maybe even completely split. I kept it short and kept it polished, using the polish as a sort of "glue." I tried gel nails, thinking they would glue it together until it had time to grow out. Bad idea. Gel and acrylic nails are hard on your nails, and my thumbnail actually still split through all that plastic. 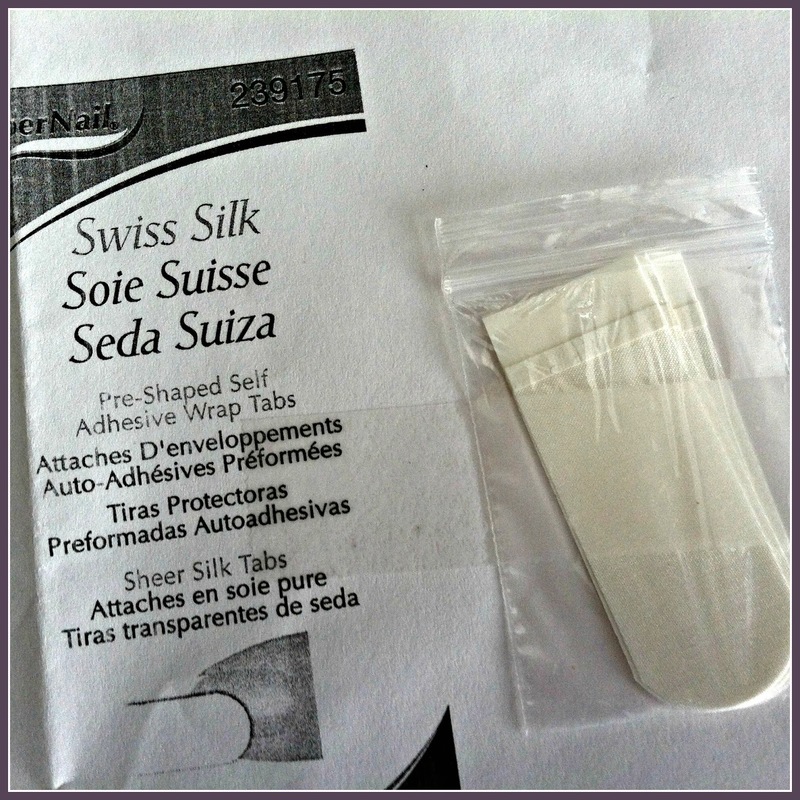 A friend brought me over some of this Swiss Silk. You cut a tiny piece of it, lay it over the tear or split and brush a special glue over it. This works really well to repair a tear until it grows out, but didn't fix the underlying problem. It also must be removed with pure acetone, which is hard on nails. Within a couple weeks of taking biotin, though, I could see my nail repairing itself. Within two months the nail had almost completely healed. All my nails are stronger and healthier, and I can go without polish. I love nail polish. 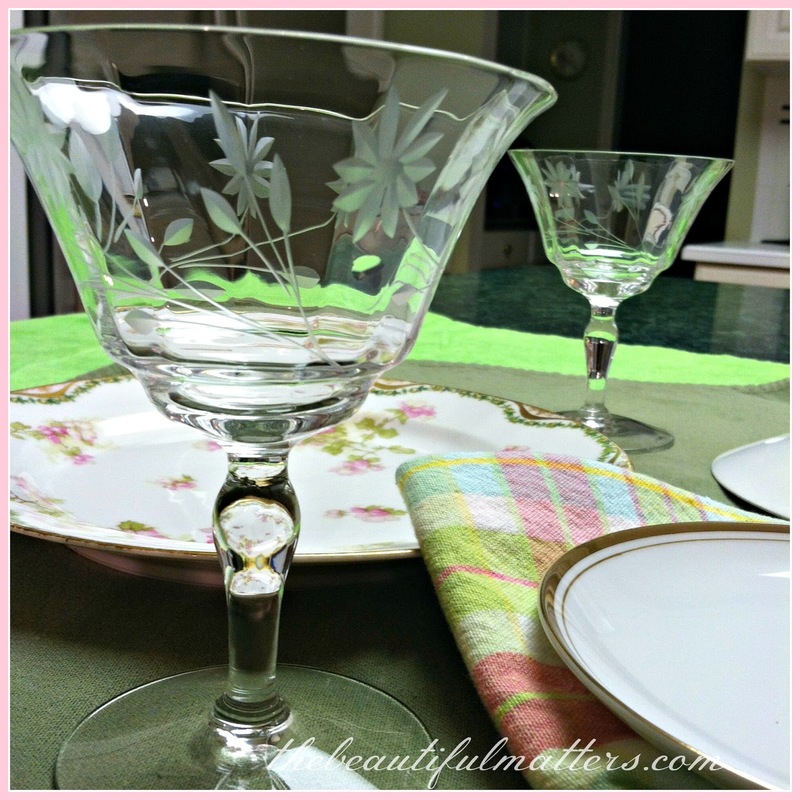 It can be a fun way to add some glitz and sparkle, or it can be tastefully elegant, or pretty and feminine, depending on what you do. But one of the reasons I have worn polish is to keep my nails from peeling. I have tried going without polish, thinking that the polish and remover was in itself further weakening my nails, but within a day or two my nails would be torn or peeling. Sustained no-polish time didn't seem to improve things either. I love the look of my new natural nails, and am going to enjoy them sans polish for awhile. It is nice not to be checking them all the time for chips. 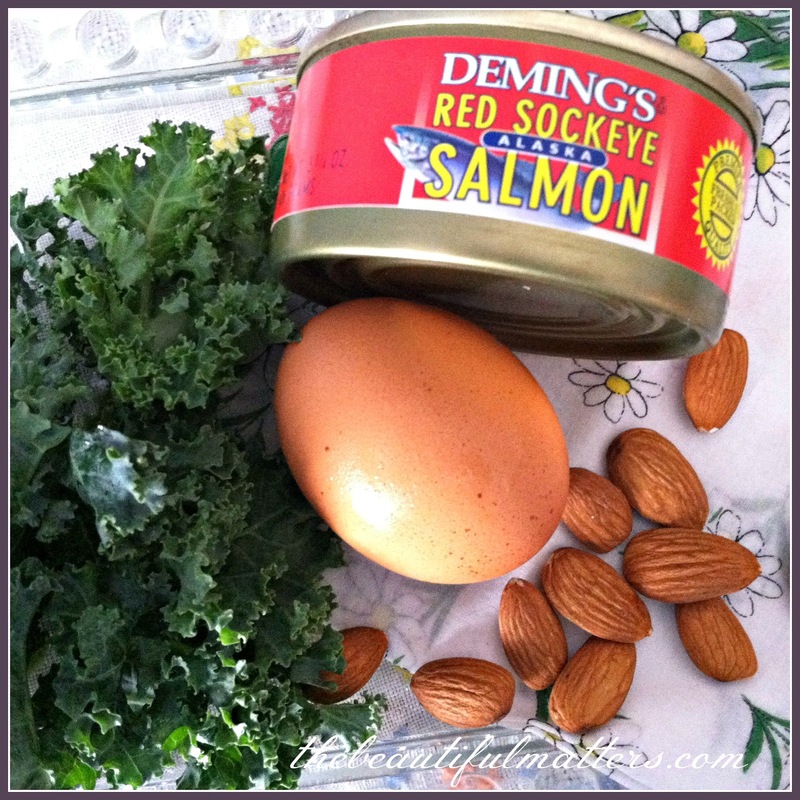 Food sources of biotin include swiss chard, whole grains, bananas, eggs, lentils and beans, and salmon. Zinc and iron are good for nails as well. Good sources of zinc include animal protein as well as beans, oats, cashews, and pumpkin seeds. Iron is also found in animal proteins, as well as in almonds, apricots, spinach, and kale. Another thing that helps protect your nails is wearing gloves when doing dishes. I always keep my yellow latex gloves at the ready. Moisturizing is also essential. 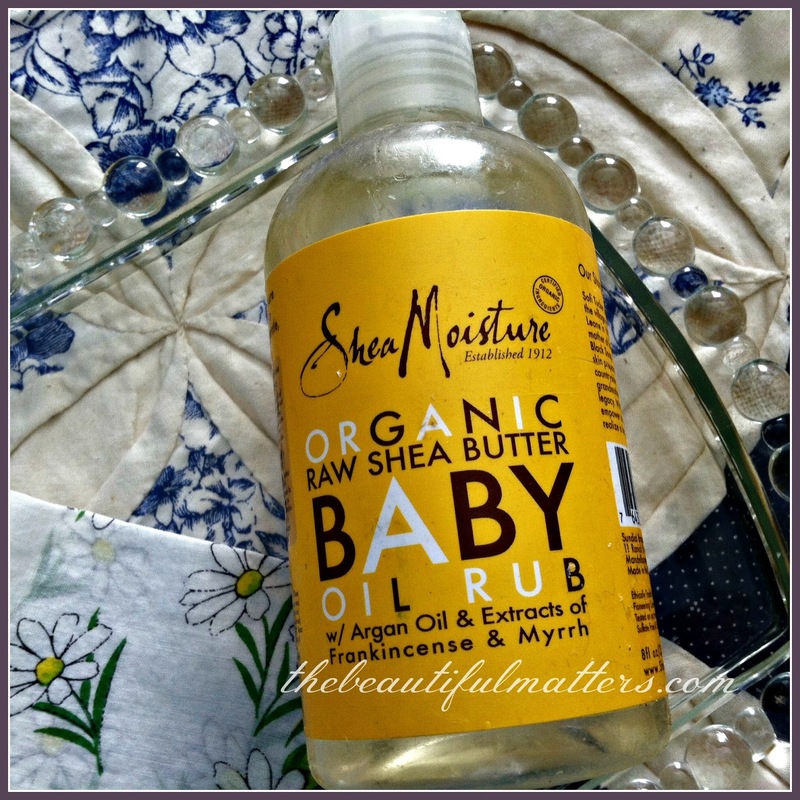 I love these moisturizers, but my go-to, the one I keep on my kitchen sink counter, is this inexpensive, and last-forever, Shea Moisture Baby Oil & Rub. It's available at CVS and Target and has argan oil and frankincense and myrrh extracts. Don't let that scare you. The scent is very subtle. 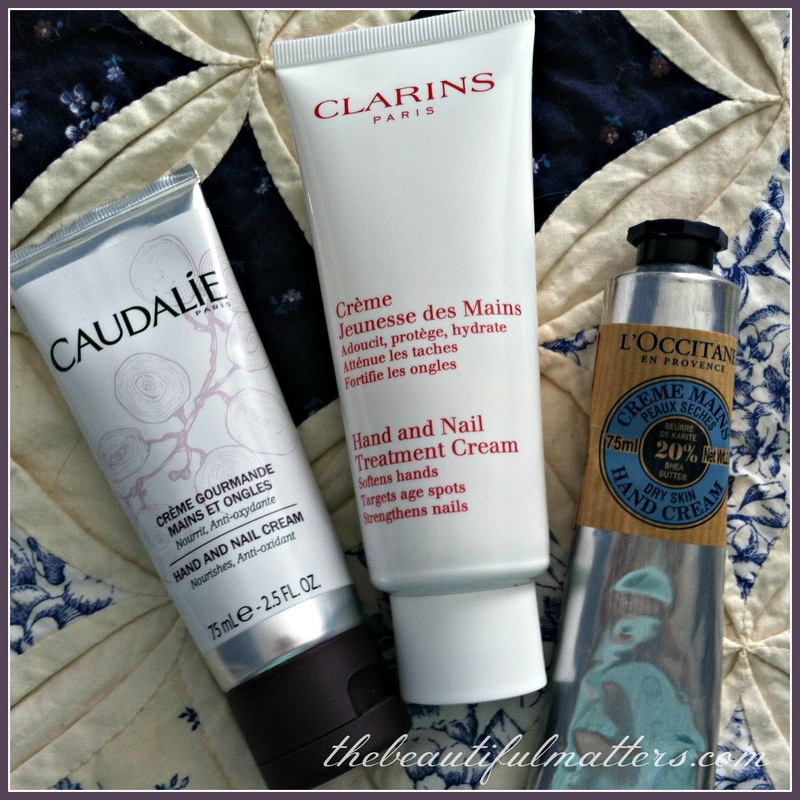 I just rub in a few drops and massage it into my cuticles; pure luxury for about $10. I've had mine for six months, and am only a quarter way through the bottle. It is oil, so it takes a couple minutes to absorb into the skin. 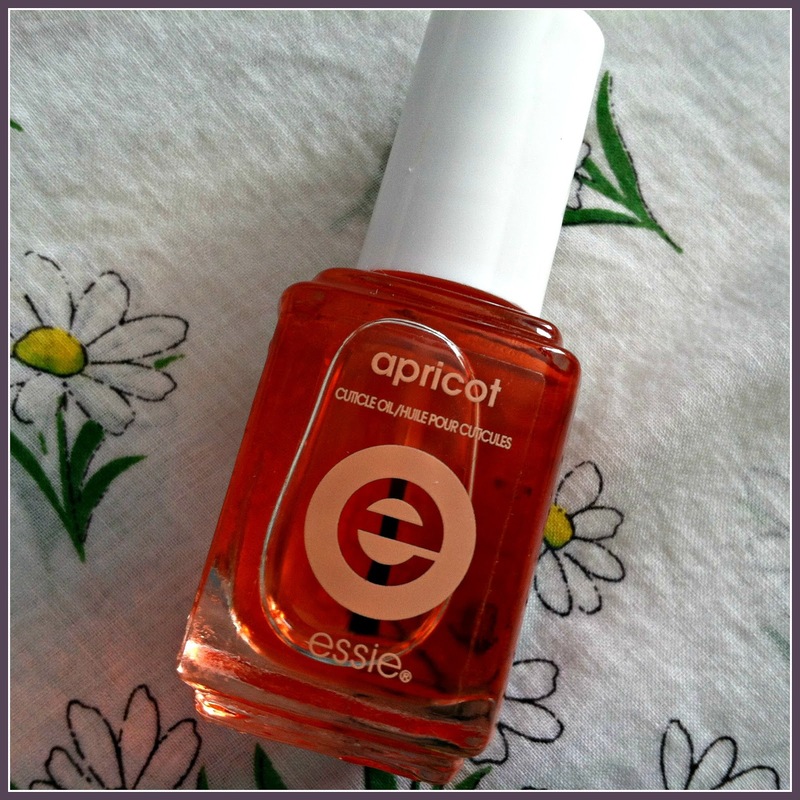 Here is a cuticle oil that gets rave reviews, and it smells good too. I see it has parabens in it though . . . sigh. Paraben is a preservative, used in thousands of makeup and beauty products, but there is some controversy as to its safety. I guess maybe I'll just continue to rub natural oils into my cuticles. 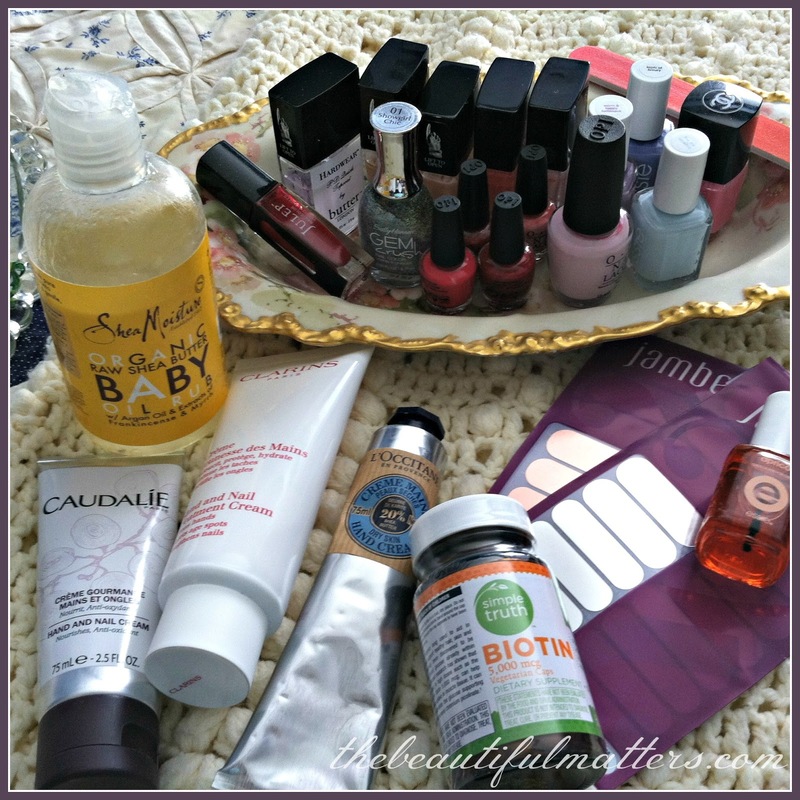 With all this talk of natural, do we even want to know what's in these favorite polishes? My two current favorites below, Mod About You by OPI and find me an oasis by essie. 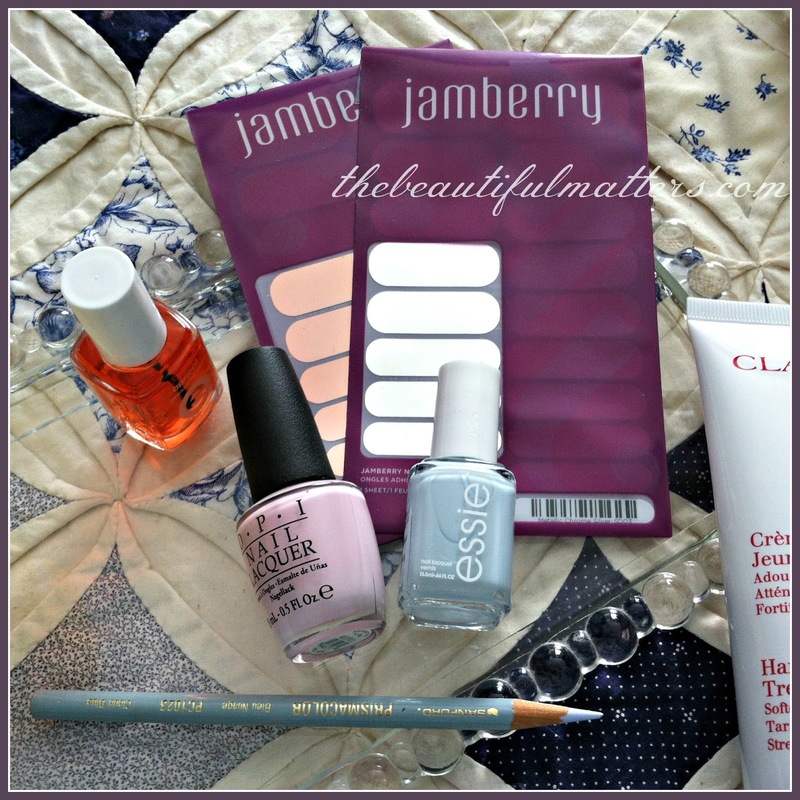 I haven't tried the Jamberry nail wraps yet, but will report back. Anything that's not going to chip is definitely worth a look. I am not a purist by any means, but I am trying to avoid as many chemicals as I can. Some nail polishes contain the "toxic trio," formaldehyde, toluene, and dibutyl phthalates. There are now lots of "3 free" and "5 free" (the toxic trio plus camphor and formaldehyde resin) nail polishes out there at different price points. Chanel's polishes are 5-free. Who knew? Some have claimed to be 3- or 5-free but aren't. I guess do your homework if you're concerned. Helping me today has been The Official Blog Cat. 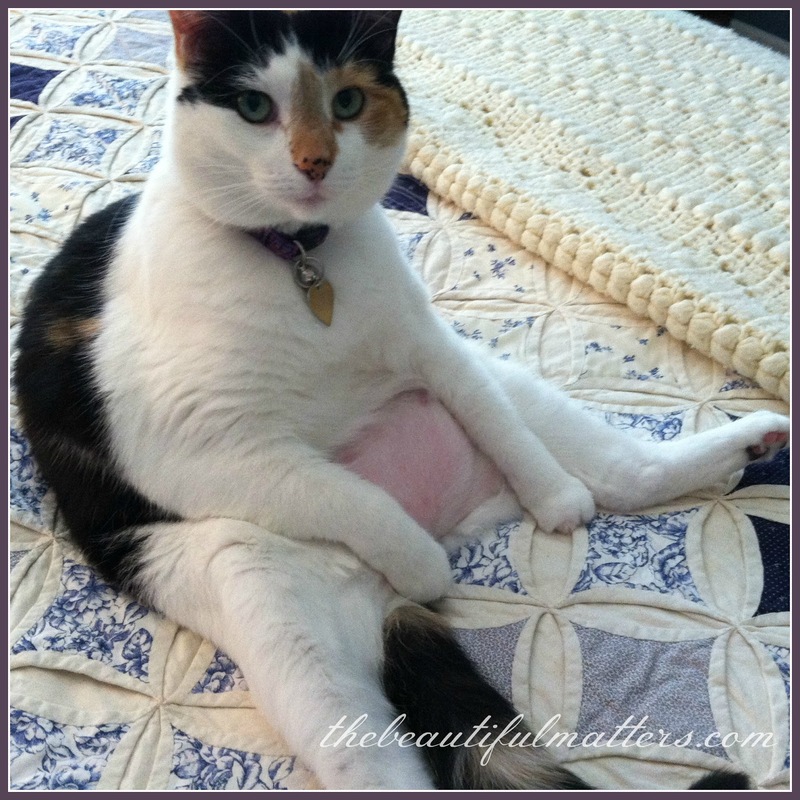 Admittedly, this is not the most flattering shot. 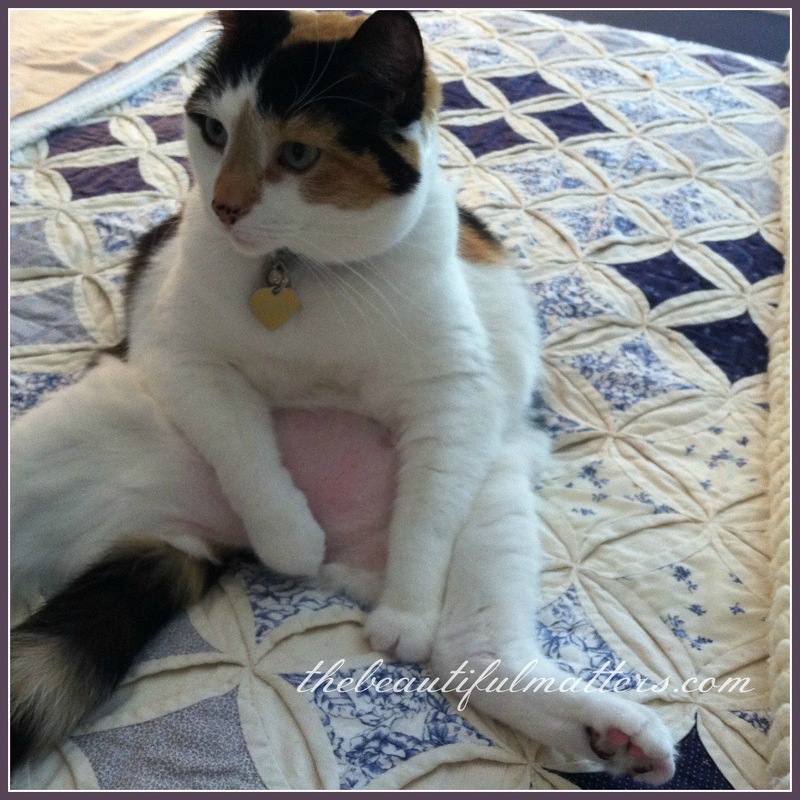 I'm ashamed to say I laughed so hard that my dear kitty jumped off the bed and stalked away in offended dignity. On the bed is a cathedral window quilt. I made about 75% of it back before I had children. It then sat in a drawer for 20 years !! until my mother finished it for me. All hand stitched. One of the few large sewing projects that I actually (almost) finished. 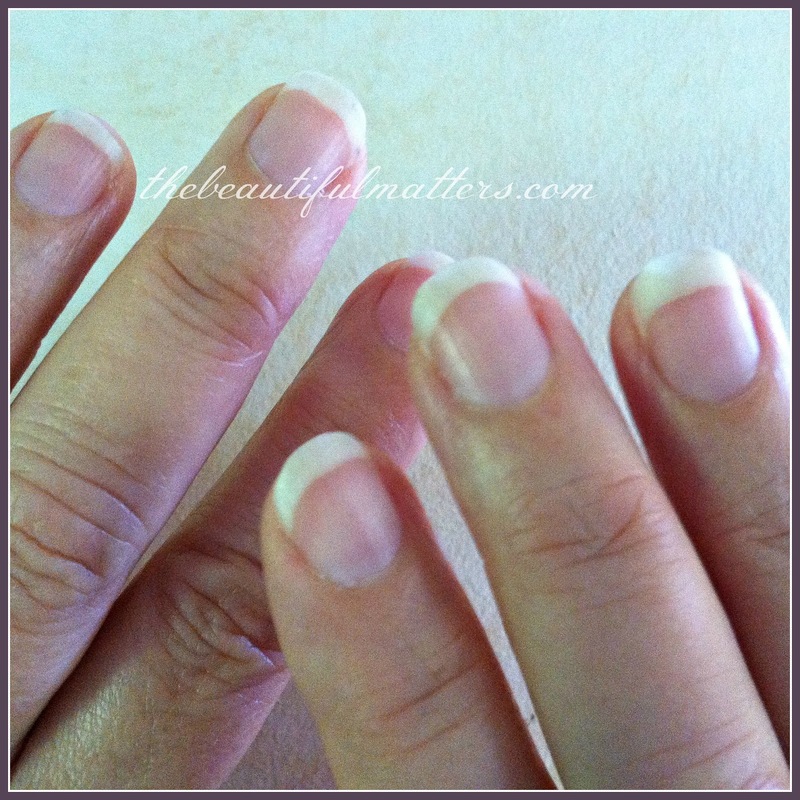 Do you have any tips for healthy nails? All this time I've been blaming the squirrels for emptying our bird feeders. Seems there's been another culprit in the neighborhood. Someone was just telling me that his friend has spent $2500 !! on contraptions trying to keep squirrels away from his bird feeders. They just tear everything down apparently. I can't even imagine. That has got to be made into an Adam Sandler movie. I was leaning on the deck railing yesterday afternoon staring absently into the woods as I chatted with my son. He lives out of state, and although it's been two years, I still haven't gotten over missing him. It was a blessing to lean there, feeling the warm sun on my shoulders, listening to my son share his week with me. As I was listening, my eyes focused as I spied something small and white on the floor of the woods, in the shadows of a clearing. I didn't think there were any "clearings" in our woods, only a thick growth of underbrush. But there they were, in a patch of ground clear of bramble and brush, tiny, bell-like flowers among glossy green leaves. After I finished talking with my son, I got some scissors and headed down the stairs from the deck. 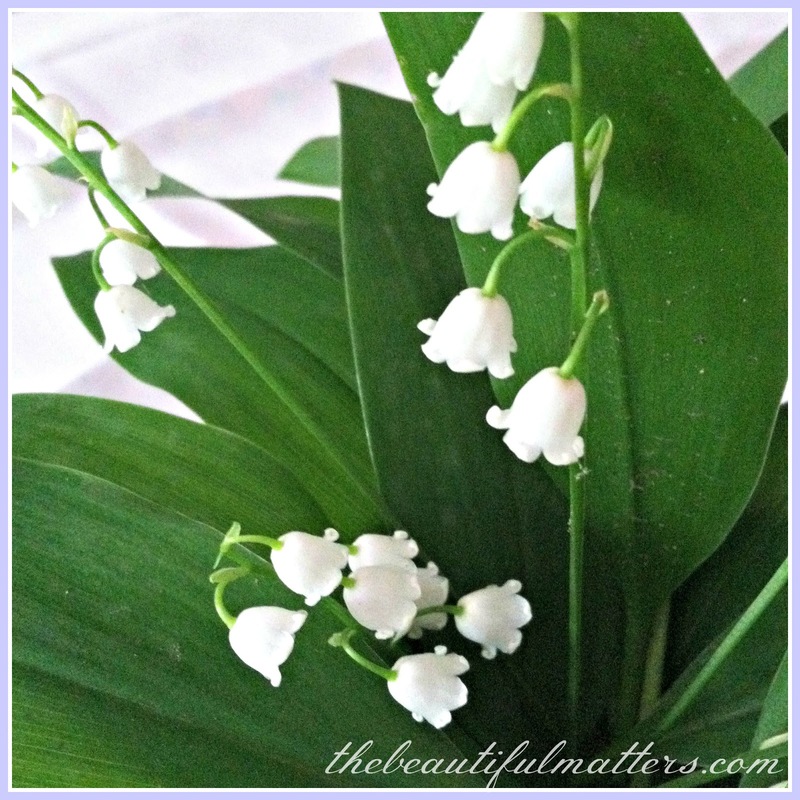 I ducked under the low branches of a hawthorn bush and cut a small bunch of these beautiful lilies of the valley. In the middle of enjoying one blessing, I almost missed another. But there they were, just waiting for eyes to see. Serendipity? Yes, I like that word. It means an unexpected, happy surprise. I like to think that God delights in blessing us in small ways as well as in big ways. 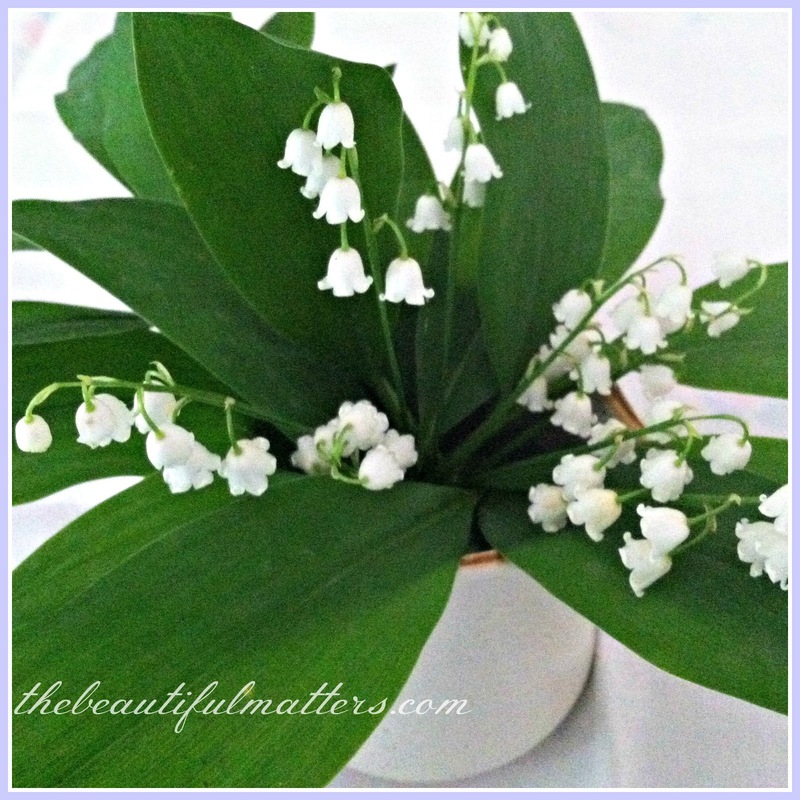 You see, in the language of flowers, which I've written about in my last two posts, lilies of the valley mean return to happiness. I've been feeling sad over a few things lately. 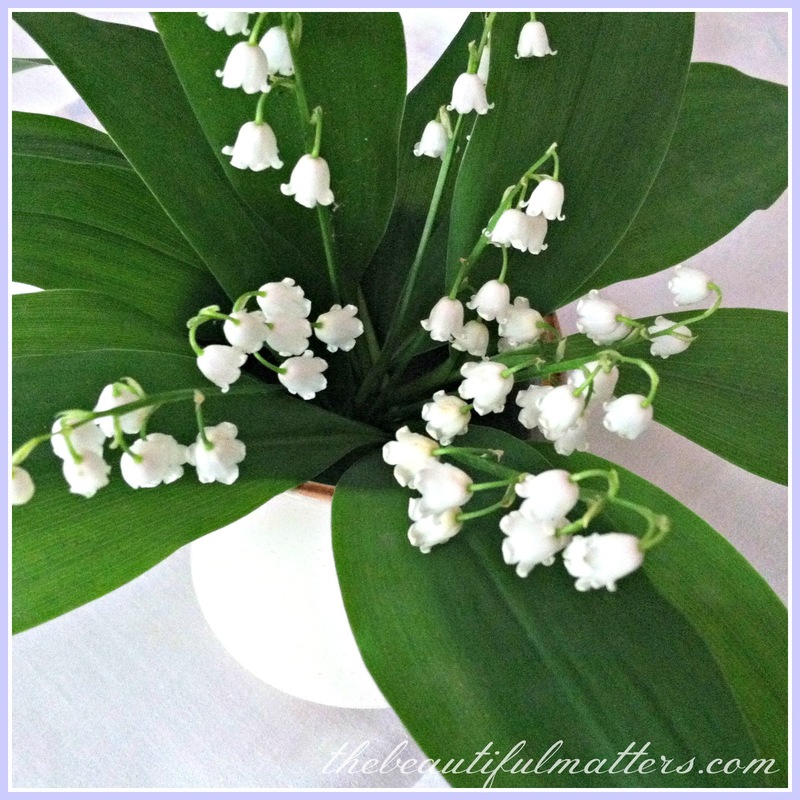 This little, beautifully fragrant bouquet is a lovely symbol of hope for me, a promise that happier days are ahead. Blessed be the Lord, who daily loadeth us with benefits . . .
Wishing you a happy day filled with gentle joys, friends. Sharing with A Return to Loveliness. I went to the nursery this week. I think I can finally safely plant. 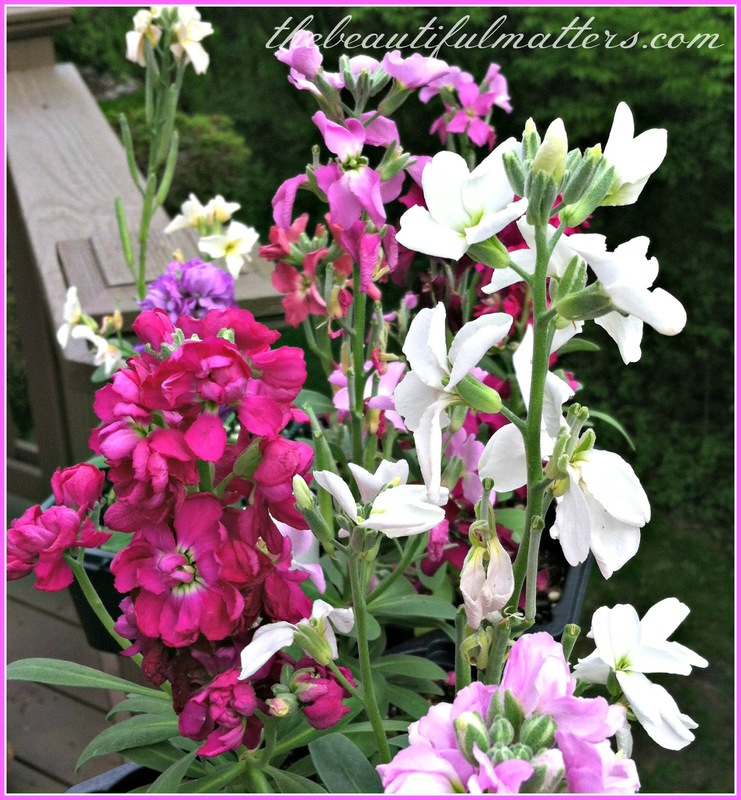 I only do container gardening as we have no backyard to plant an actual garden. The woods back up almost to our deck. And truth be told, I'm not much of a gardener anyway. I do love flowers, though. I've always dreamed of having a huge cutting garden, with staff of course. They would take care of the weeding and trimming and mulching and such. I would wander through it, basket and scissors in hand, Jane Austen style, cutting lovely bouquets to place around my house. After the exertion, I would sit on the porch fanning myself, and sipping cool lemonade, the ice clinking in the chilled glass. 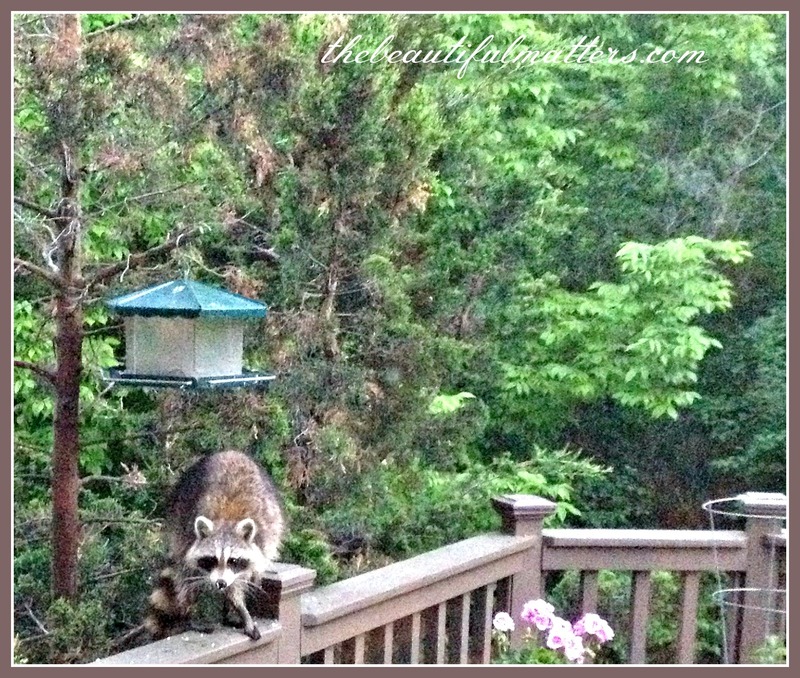 I make do, however, with my pots of flowers and herbs on the deck, and enjoy watching the variety of birds that nest in the woods and frequent our feeders. Of course, it's not hard to "make do" with this at all, a secluded little area full of beauty and peace. 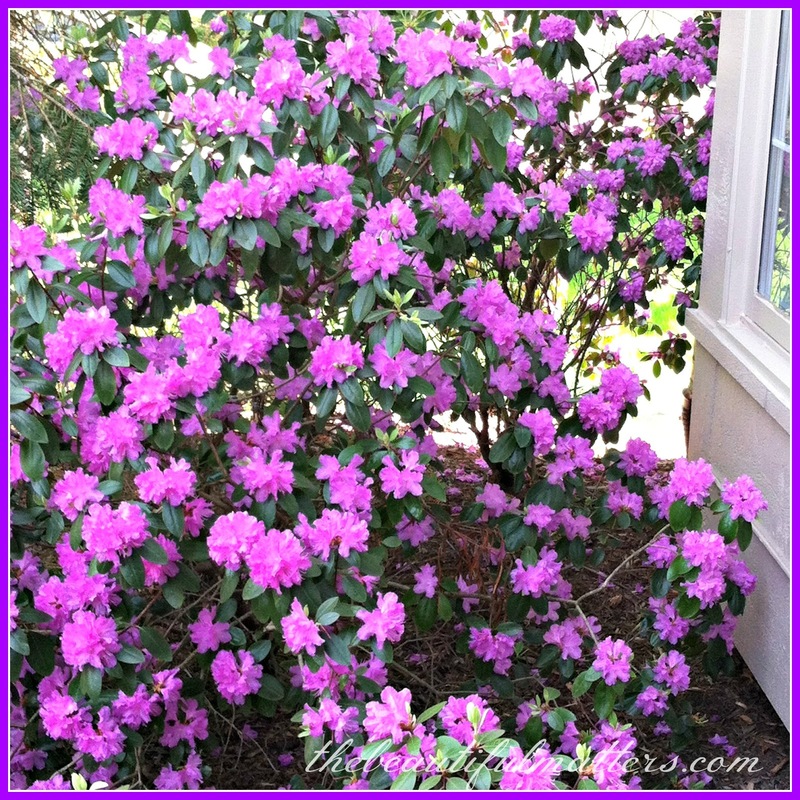 It asks for so little (watering and dead-heading, and that's all), and gives so much. I was excited to find stock this year at the nursery. 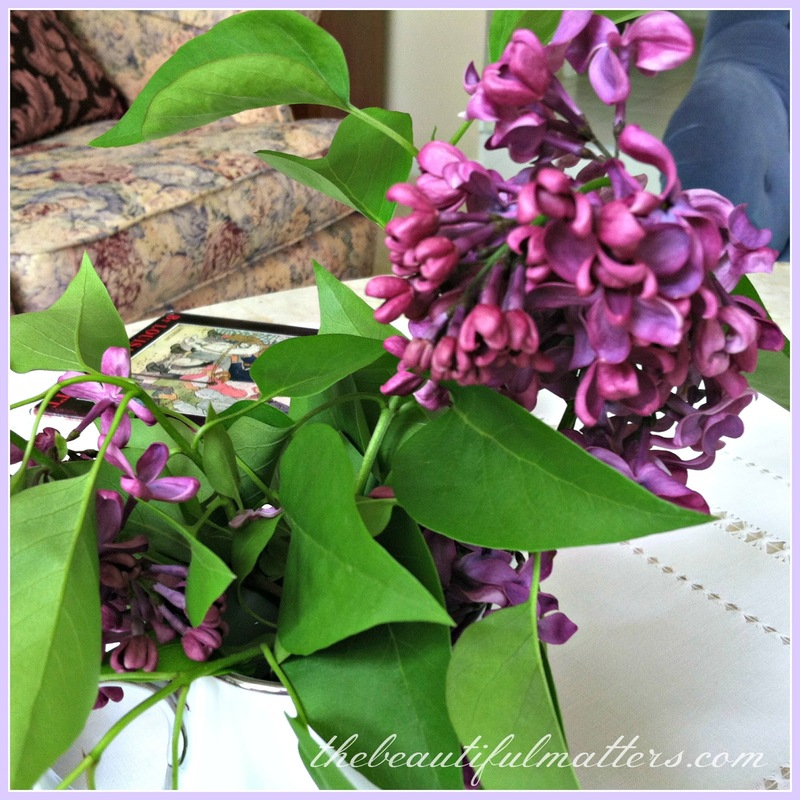 Such an old-fashioned, lovely-scented flower. 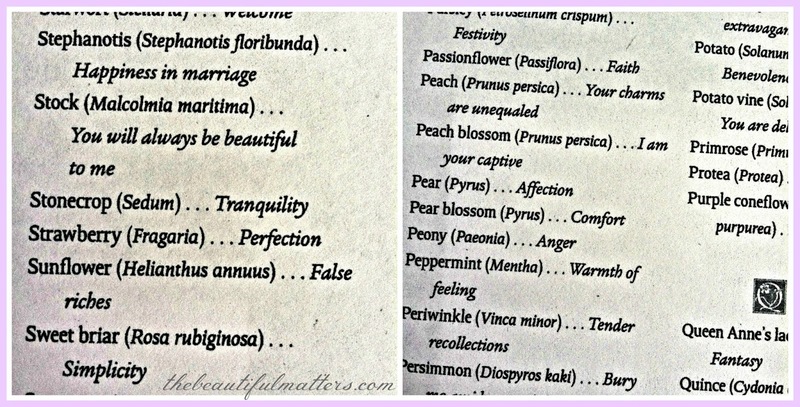 Because our book club just read The Language in Flowers, I've been looking up all the meanings of the plants I brought home. Stock means you will always be beautiful to me. In the book, the young couple places stock on each other's pillow at night. 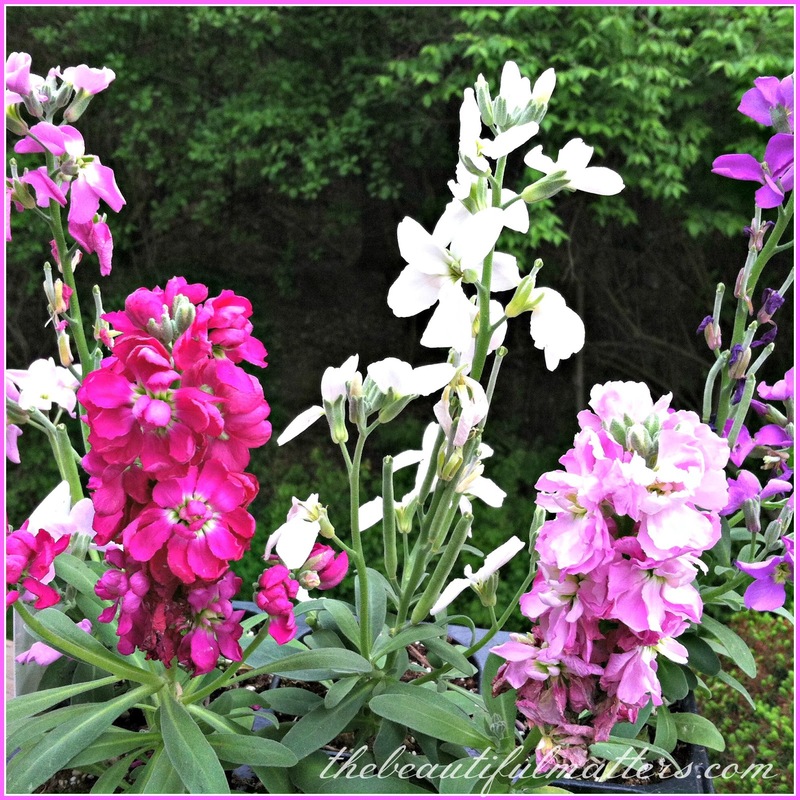 Stock is native to Greece and the northern Mediterranean, and was first brought to the U.S. by Thomas Jefferson, an avid gardener who introduced many European flowers to our country. Stock has a lovely, clove-like scent. 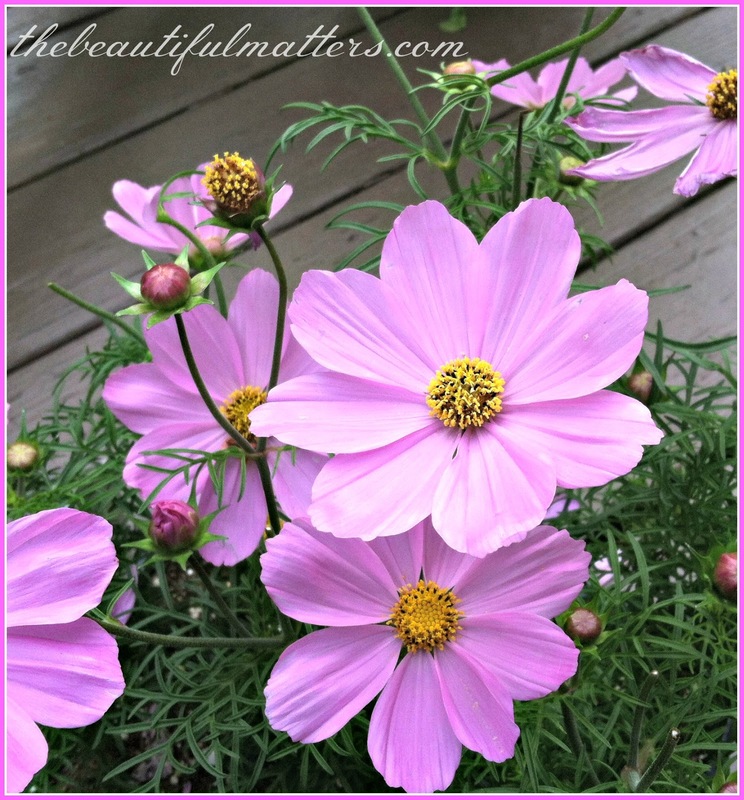 Cosmos stands for joy in love and life. 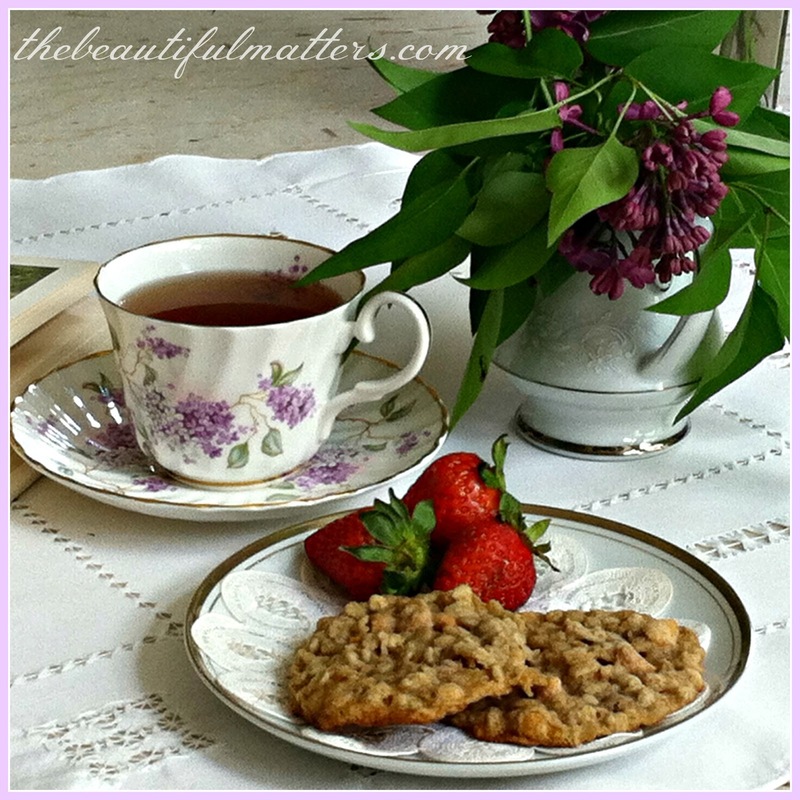 Several of my blogging friends were unhappy to learn that peony represents anger. I don't blame them. I love the full, gorgeous blooms of the peony. I think it should stand for extravagant beauty or luscious beauty. Hey, it's not like this language of flowers is a law or anything. I say change it if you want. 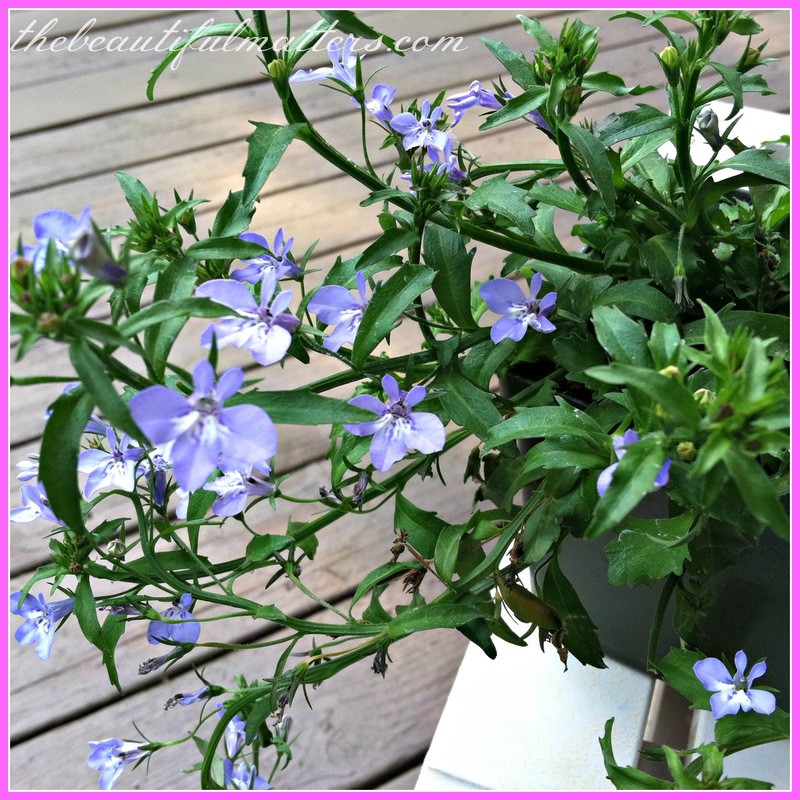 For example, I picked up this beautiful lobelia. It means malevolence. Oh dear. I was sitting on the deck with my son, considering this meaning and possible alternatives, and asked him what the flowers might mean. He said calming. I'll go with that. I suppose if the Victorians wanted to communicate through flowers, they needed to be able to express the whole range of human emotion, not just positive regard. So some flowers would have to be designated to represent hurt feelings, sadness, or jealousy. For example, let's say a young woman has realized that her lover has been flirting with someone else. She might send him a bouquet of striped carnation (I cannot be with you), redbud (betrayal), mustard (I am hurt), and a Michaelmas daisy (farewell). 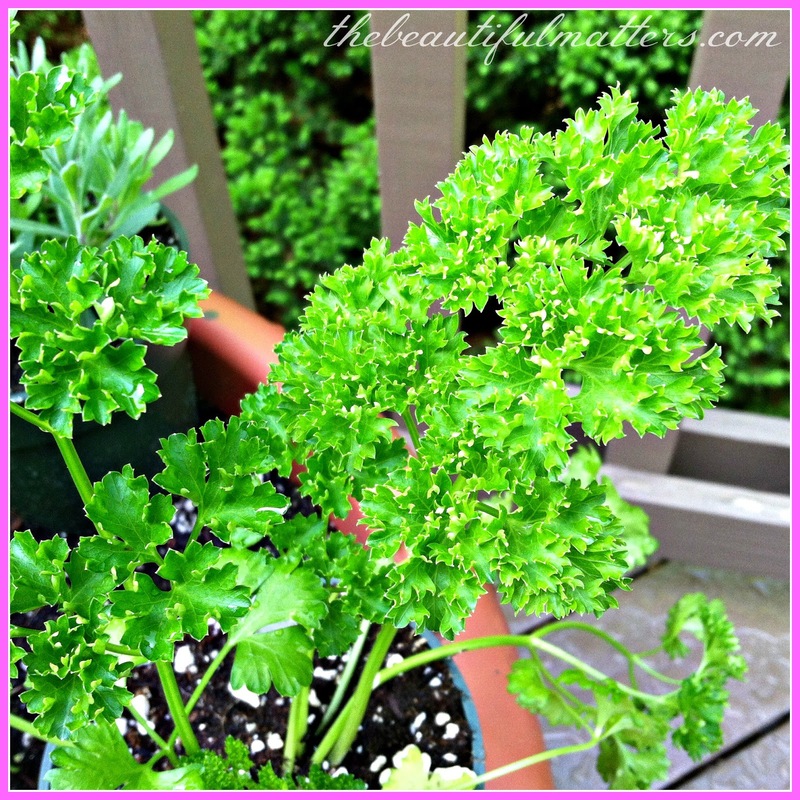 If she was really angry and spiteful, she might add tansy (I declare war against you)! Her best friend, in sympathy, could send her a bouquet of yarrow (cure for a broken heart), thrift (sympathy) and snowdrops (consolation and hope). In this spirit, I put together a little bouquet for book club the other night. I included parsley in it, which means festivity. We did laugh a lot. Hmmm . . . 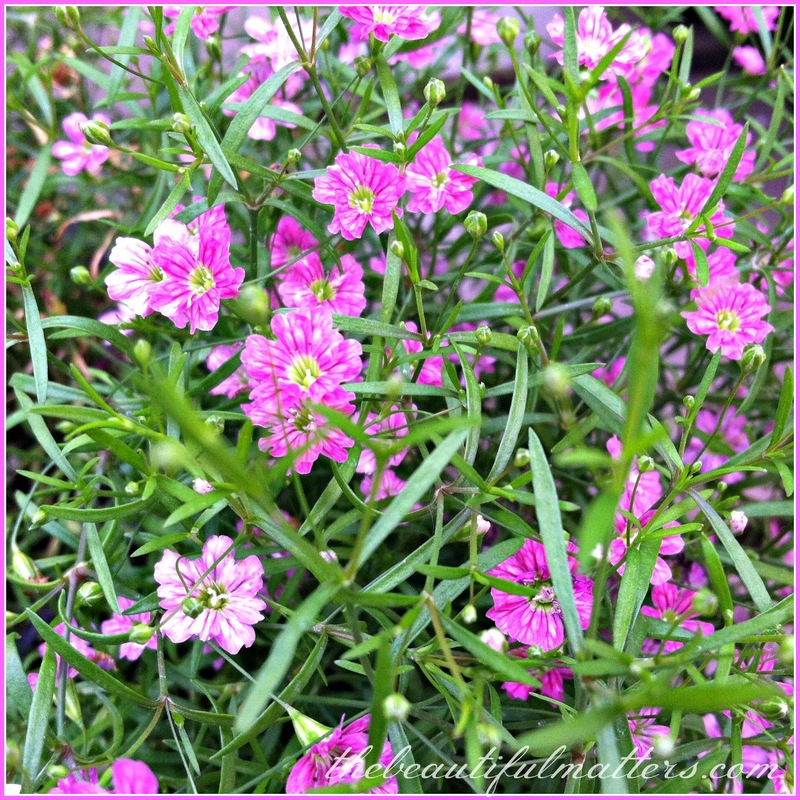 This beautiful baby's breath represents everlasting love. 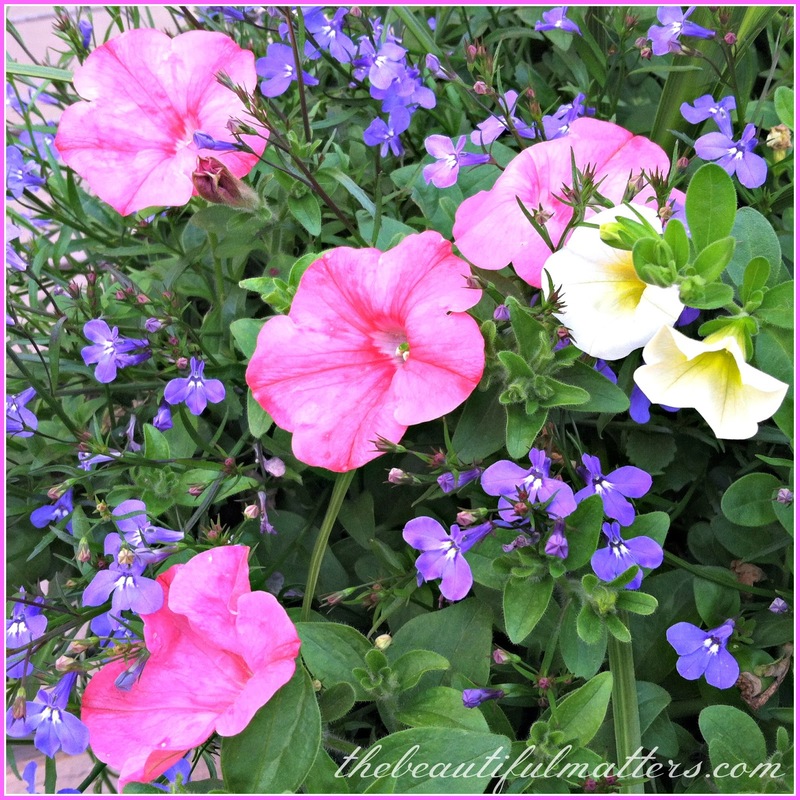 Petunia means your presence soothes me. I found this sentimental poem, written in 1872 by James Gates Percival, and set to music by Edward Elgar, the English composer, when he was just 14 years old. It was dedicated to his sister Lucy on her birthday. On its leaves a mystic language bears. From the myrtle's snowy flow'rs is drawn. Innocence gleams in the lily's bell. Pure as the heart in its native heaven. By the glossy leaf of the bay are given. In a twine of evergreen fondly wreathes. Speaks in thy blue leaves "forget-me-not". And tell the wish of thy heart in flowers. 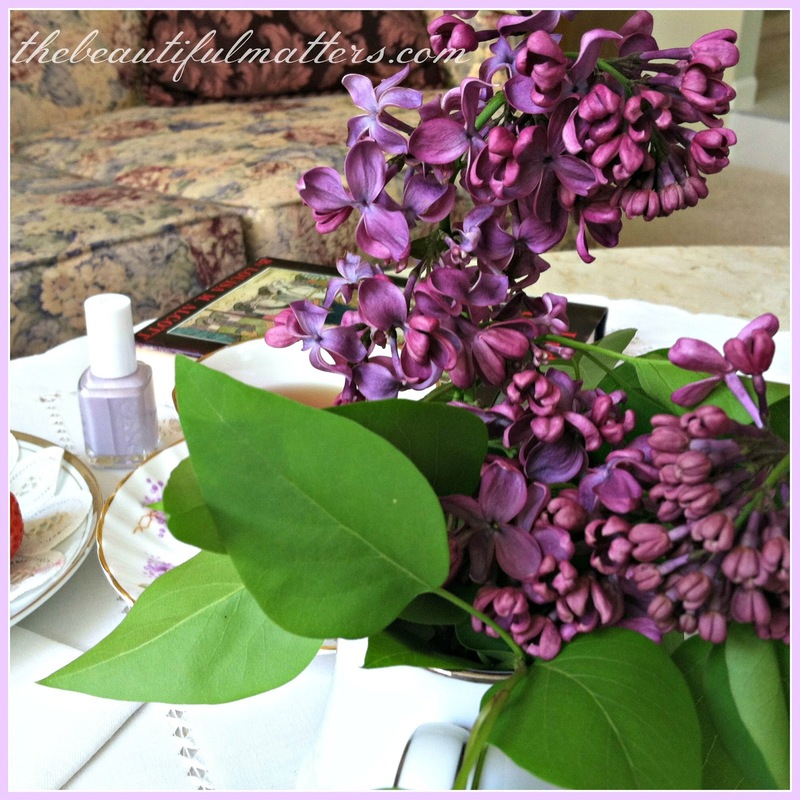 In honor of our lilac bush bursting forth into bloom this weekend, I am having a lilac tea. This teacup is Crown Victorian, Staffordshire, England. I made Victorian Earl Grey black tea, a loose tea I purchased from our local tea shop. 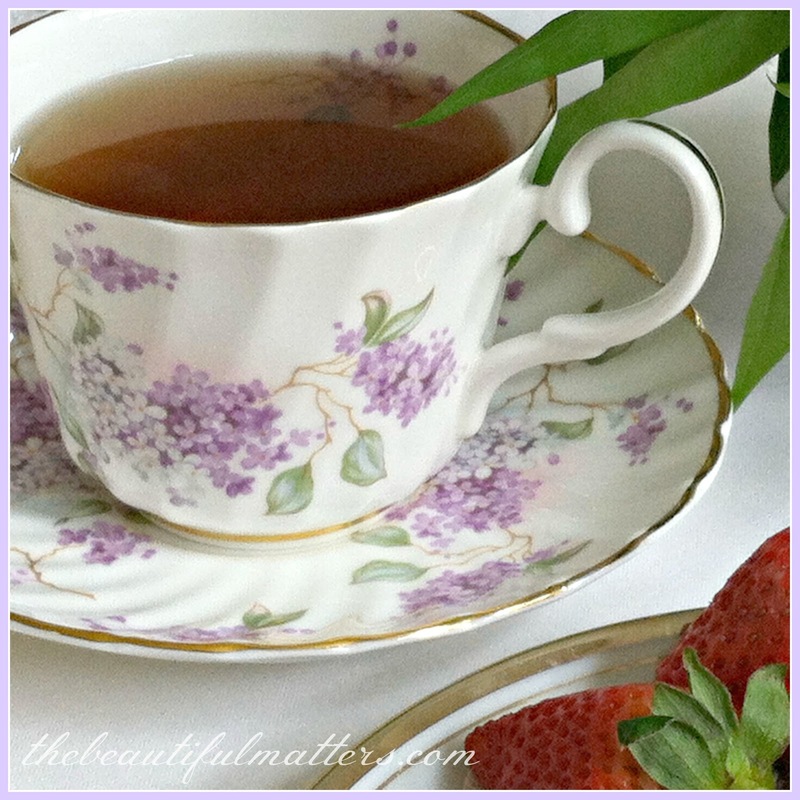 There are rose petals and lavender in this blend of tea. My youngest, home from college, loves oatmeal scotchies. His sister made him some. He shared. 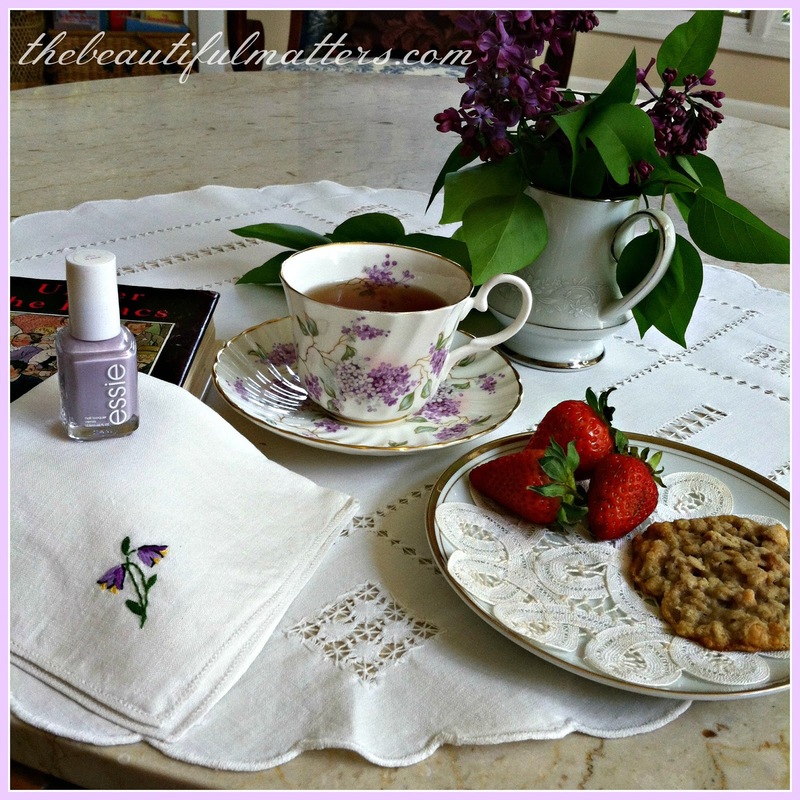 This book was perfect to thumb through during tea, don't you think? This copy was published in 1928. 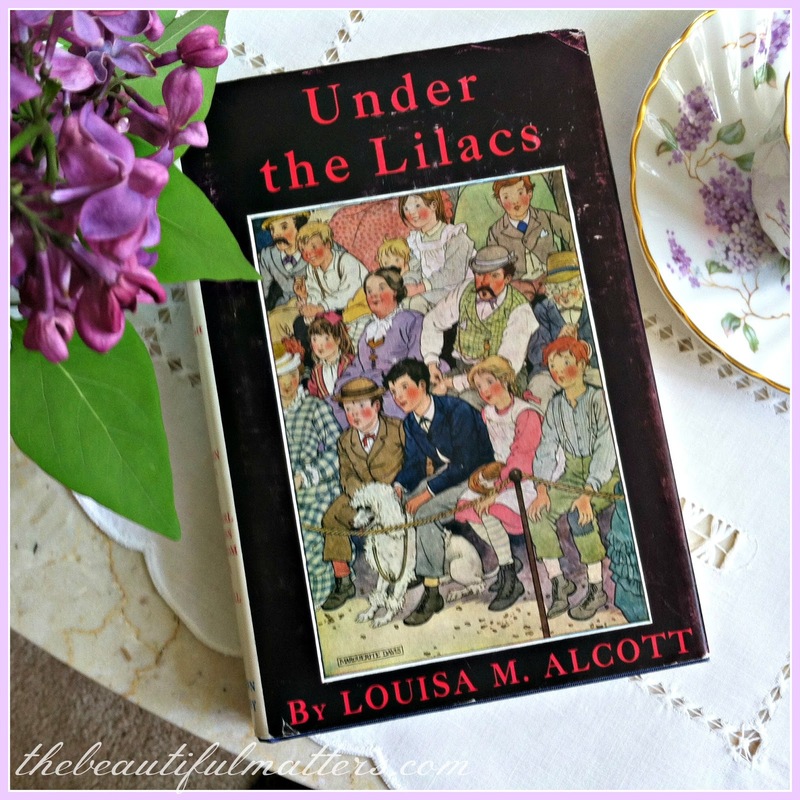 I have a set of eight of these "Orchard House" editions, including Little Women. The illustrations are sweetly old-fashioned. 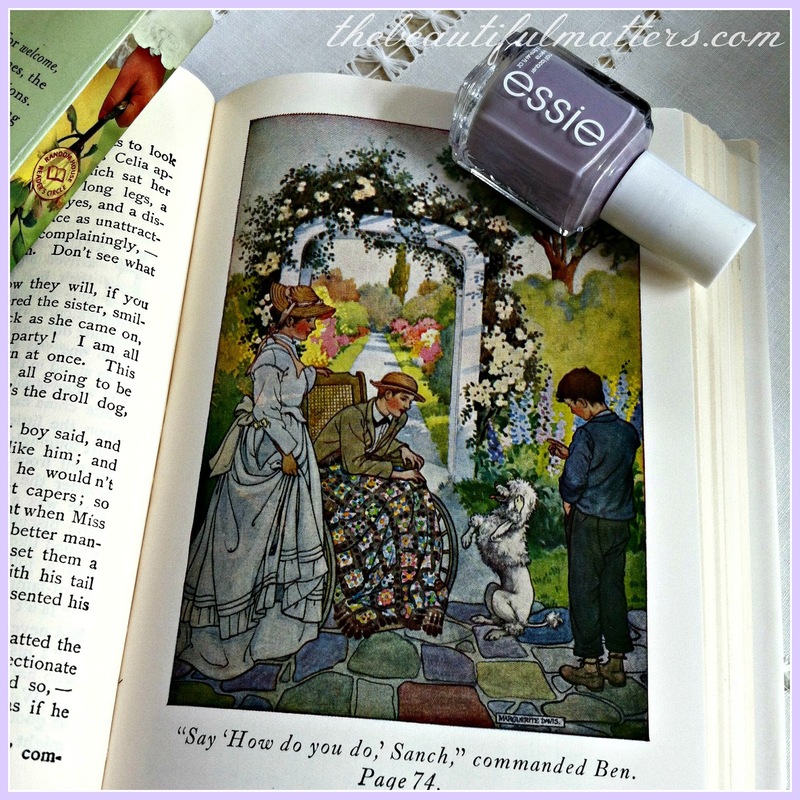 Holding the page down for me is essie's nice is nice, a lilac-colored nail polish. Holding down the left side is The Language of Flowers. I stayed up until one a.m. the past three nights reading this for book club, which is meeting here tonight. I really liked it. It is about a girl who has gone through the foster care system and has severe attachment disorder. 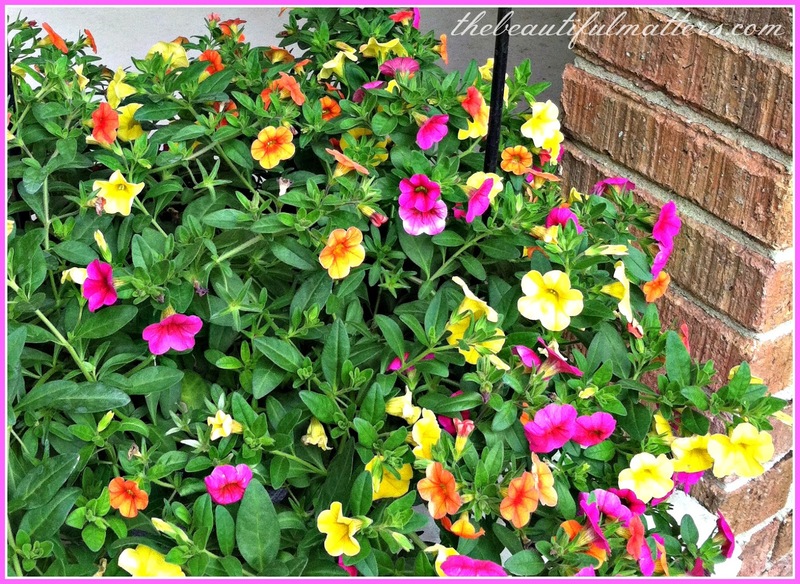 She loves flowers, and has learned how to communicate her feelings using their "language." Not an easy read, but definitely rewarding. 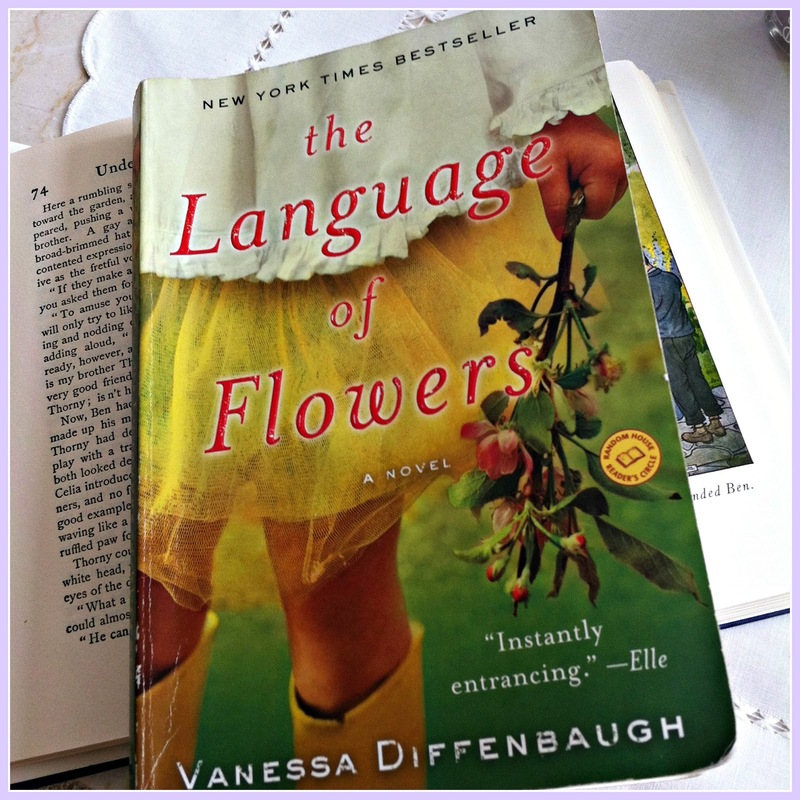 One of the most interesting parts of the story is the actual language of flowers, taken from Victorian times, when flowers symbolized the sender's feelings. A red rose represents love, of course, but did you know that so does myrtle? Kate, the Duchess of Cambridge, carried a bouquet at her wedding that used royal family tradition and the language of flowers. Her bouquet had myrtle, lily of the valley (return to happiness), ivy (fidelity), and, of course, sweet William (gallantry). The book includes an index of flowers and their meanings. Hmmm . . . too bad about the peony. 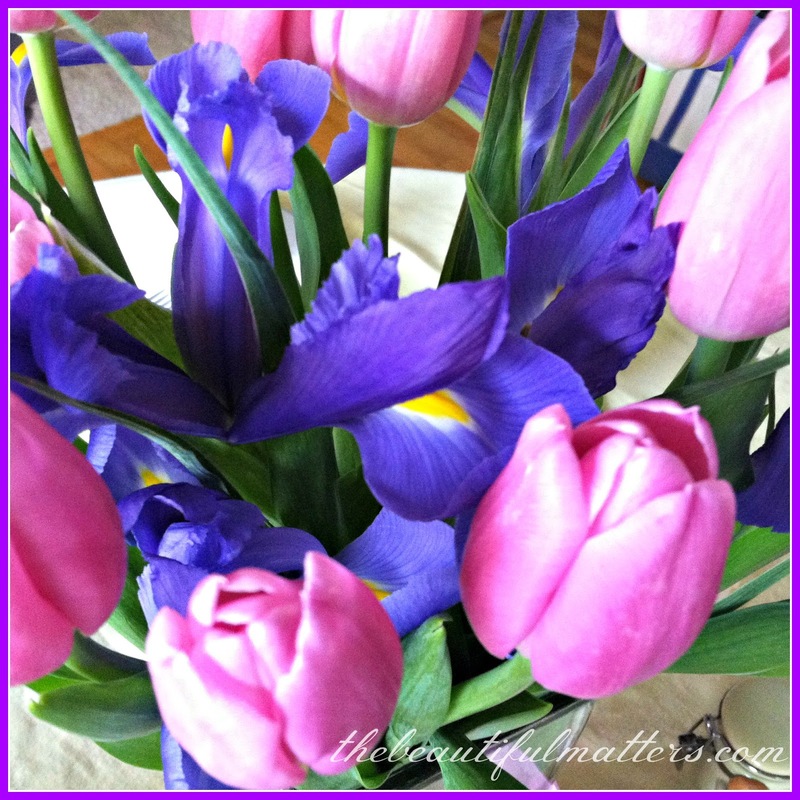 I like the idea of choosing flowers with a message, or putting together a bouquet for someone with special meaning. 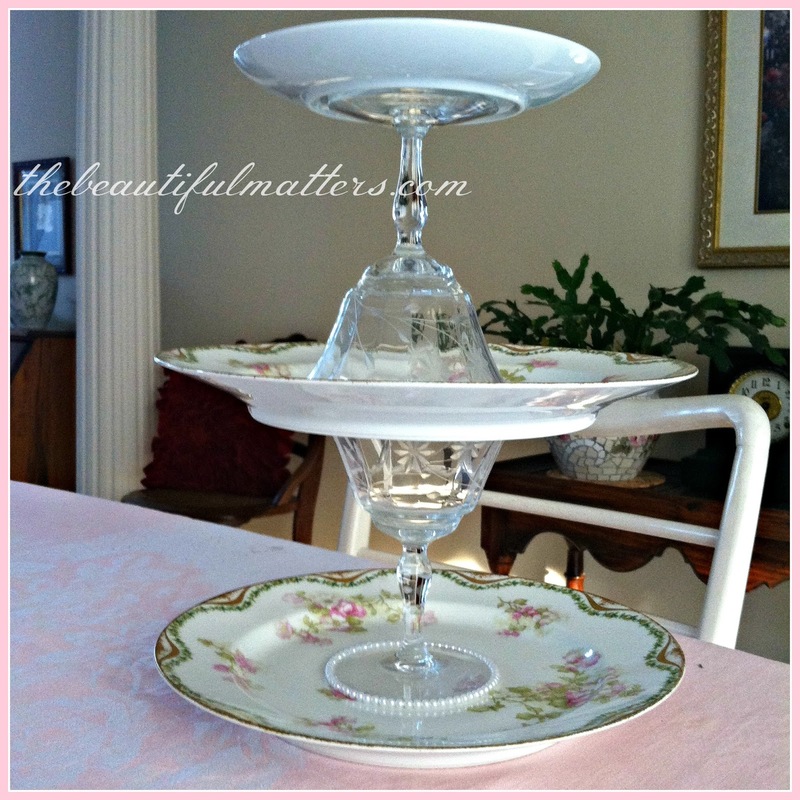 I had thought about doing this for our tea table at book club tonight, but where to find the right flowers? Perhaps I can find an oak-leaf geranium (true friendship) at the nursery. But not a scarlet geranium -- that means stupidity. Although it is true that we have read a few heavy tomes that have challenged us, and made us feel a little . . . dense. 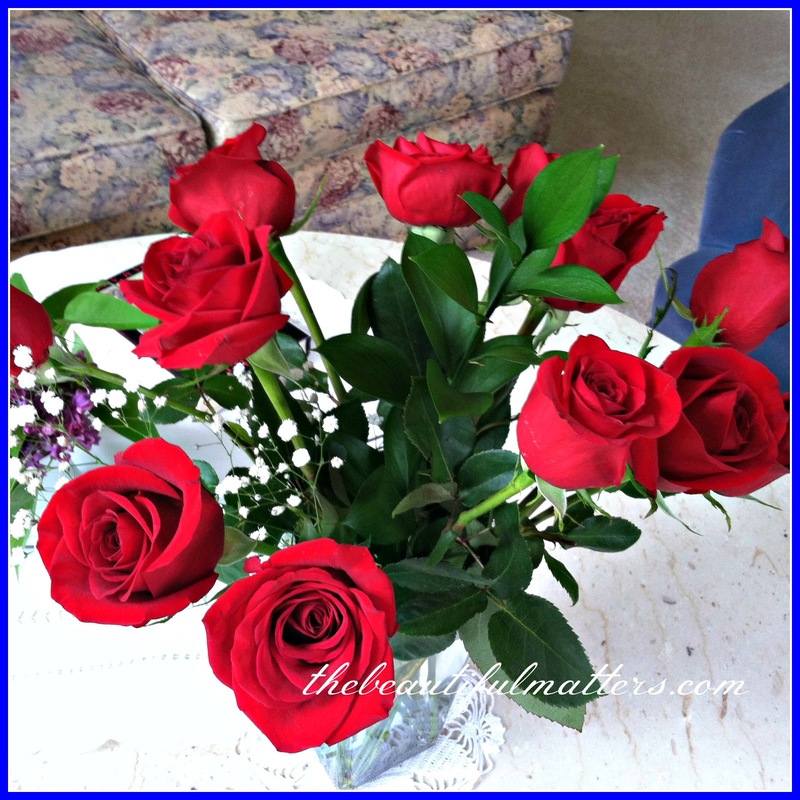 In other flower news, check out these lovely red roses, a gift from my husband for our anniversary. Thirty-three years! He knows the language of flowers. I will be joining these parties this week . 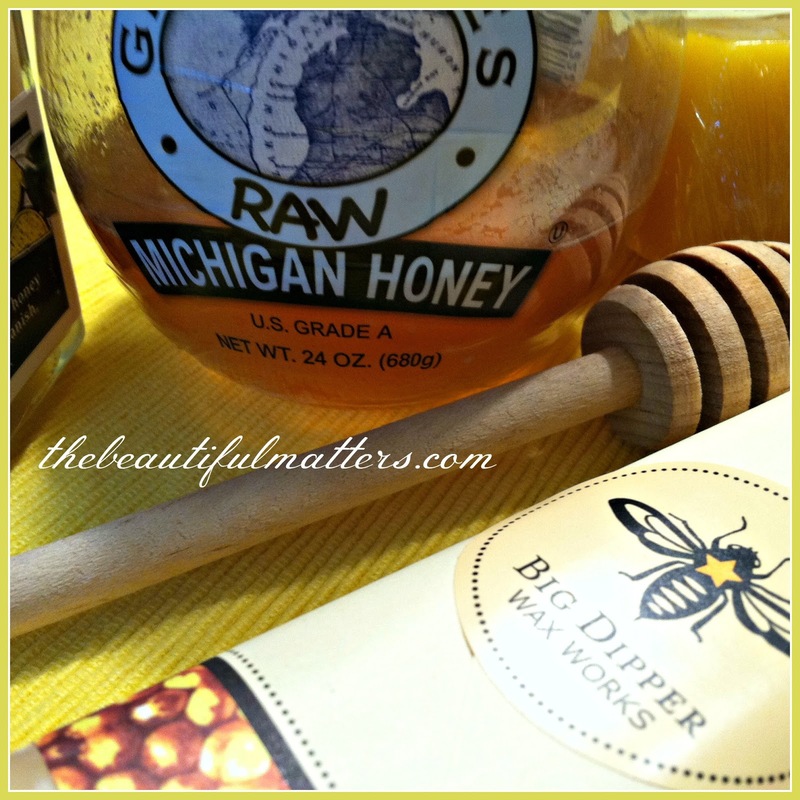 . .
My son, eat honey, for it is good, Yes, the honey from the comb is sweet to your taste. I just finished a large project that I had volunteered to do. I had no idea how long it was going to take. I found myself feeling very resentful at times. I'm a lot better at saying "no" these days, but apparently still have some room to go. Always having been a "good girl," I have found myself being taken advantage of many times. I have always been "nice." Saying "no" feels mean. I notice the people who say "no," though, are oftentimes respected more. I have strengthened my "no" muscle, but it still needs practice. But, having committed myself, I trudged through. I was reminded of two verses as I was plodding through this project. One, about counting the cost before you begin something, as in, do I have enough time and energy to do this?, and two, about making good on your promises even if it hurts. This project was one that most people would have gotten paid for. I figured my husband and I could have gone to Italy and Greece for a couple weeks with what I should have been compensated. Sigh. Sometimes I think I have a sign on my back that says, "Hey, I'm a really nice person. Feel free to take advantage of me." And here, I definitely remembered the verse in 1 Timothy about the worker deserving his wages! Really, I'm not blaming anyone here but myself. After all, I'm the one who said "yes." No one twisted my arm. So what does this have to do with honey bees? 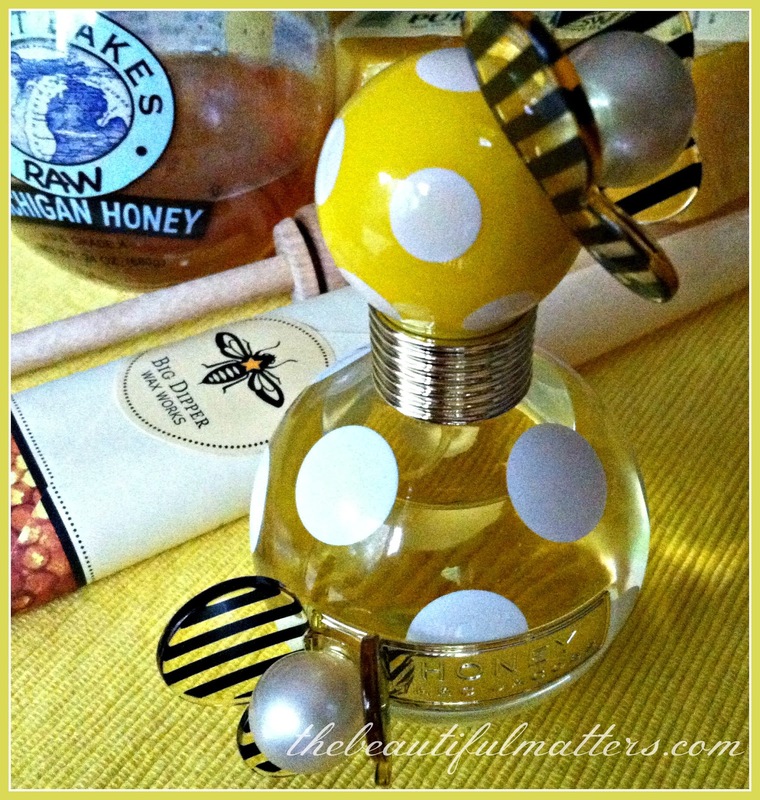 I was originally going to write today about the bee at the top of my blog header. Before I dumped out my frustrations here. But now I see how I can tie these two disparate subjects together. Why is there a bee in my header? Lovely Karen, who designed my blog, originally had a crown there. It didn't seem quite what I was going for. In a brilliant flash of insight, my daughter suggested putting a bee there. "Deborah" means bee in Hebrew. Now, I have never liked my name. There are a whole lot of us from a certain era with that name. Four of the 11 ladies in my book club have that name. There's a Deb, a Debby, a Debra, and me, Deborah. With apologies to my friends, whom I love, I don't like any version of the name. I have gone my whole life disliking it, and wishing I had gotten my sister's name, Sarah. But what if there was a way to see my name differently, to turn it into something beautiful, something I could embrace and be proud of? I have seen my name translated "busy bee." That doesn't suit me at all. It sounds like "busybody," or some frantic, uptight Type A personality, buzzing around, stirring things up, and generally being a nuisance. Granted, I could see it in a positive light, like being productive and responsible. Good traits, for sure, and necessary in life, but honestly, it doesn't sound like much fun. A drudge, a drone. I came across the translation "honey bee." Now there was an idea. The idea of being someone who brings sweetness into the lives of others. Who gathers goodness from her environment and shares it with everyone. Who takes time to smell the roses. Literally! Now, I like that. 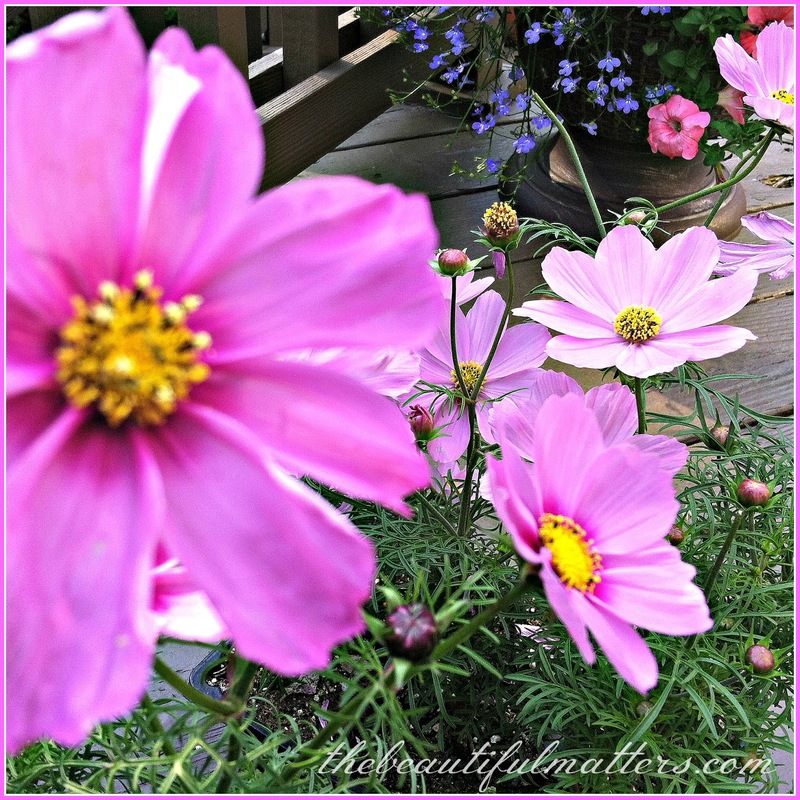 It fits in with the purpose of my blog, which is to share beautiful things, to realize that the beautiful matters. Honey bees spend their whole lives gathering and sharing good things. Isn't that wonderful? Isn't that a lovely model for a life well lived? 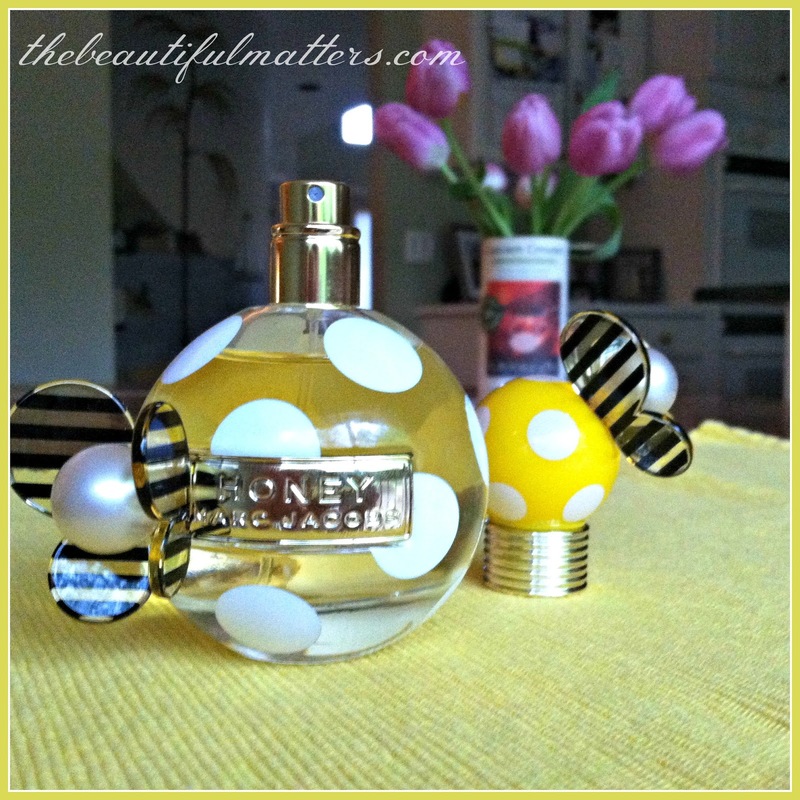 Honey by Marc Jacobs, a Mother's Day gift. This will be my summer perfume. Cute bottle a major bonus. Now how to tie in with my earlier rant? A honey bee also possesses a stinger. Threaten it, and it will remind you, in no uncertain way, that it is not to be messed with. I could learn a little from that. It's okay to protect myself. By saying "no" sometimes. By not hanging around with negative, judgmental, and bossy people. By not allowing others to dictate what I should do or how I should feel. That honey bee commands some R-E-S-P-E-C-T, in the words of Aretha Franklin. Bringing loveliness and sweetness and beauty to those around me, but setting appropriate boundaries. That little bee, that Deborah, can teach me some things. 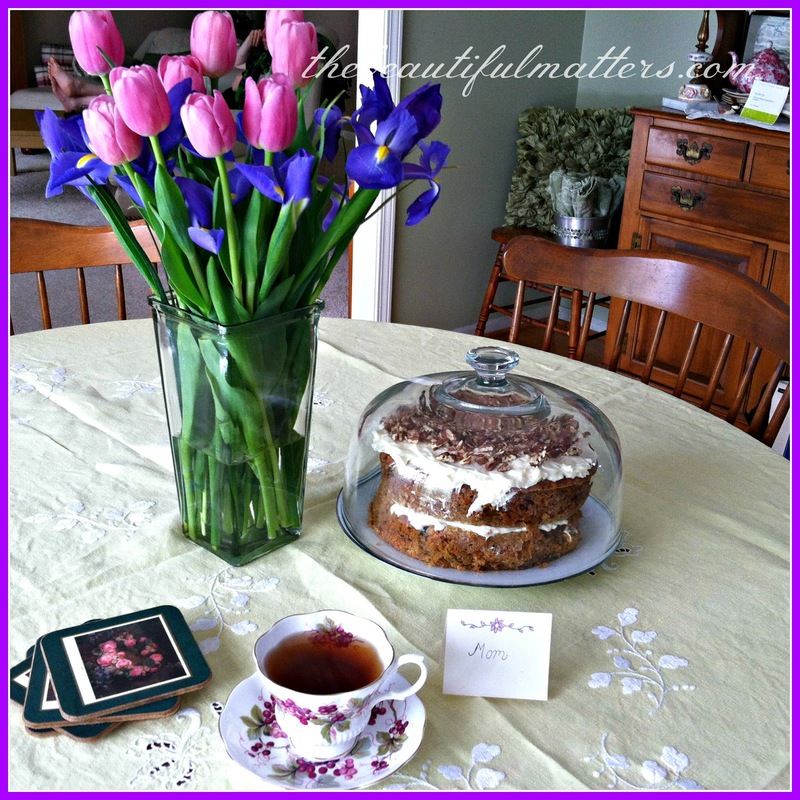 What a beautiful Mother's Day we had here! Sunny, 79 degrees, the birds singing . . . and I spotted the first hummingbird of the year, a tiny greenish-yellow, ruby-throated hummingbird, poised right in front of my kitchen window for a moment, making sure that I welcomed him properly. 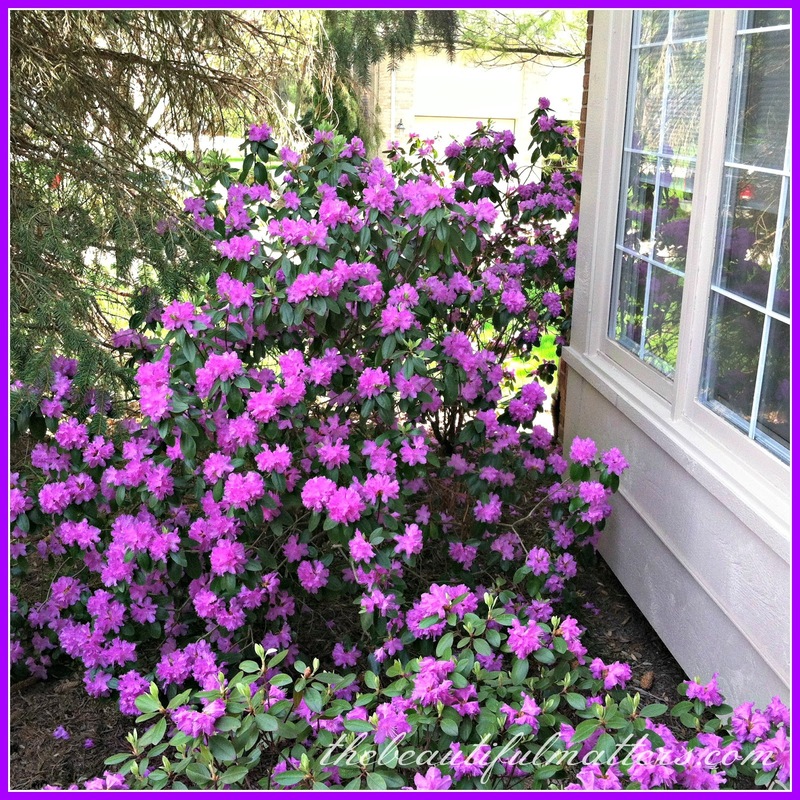 Look at these beautiful rhododendrons . 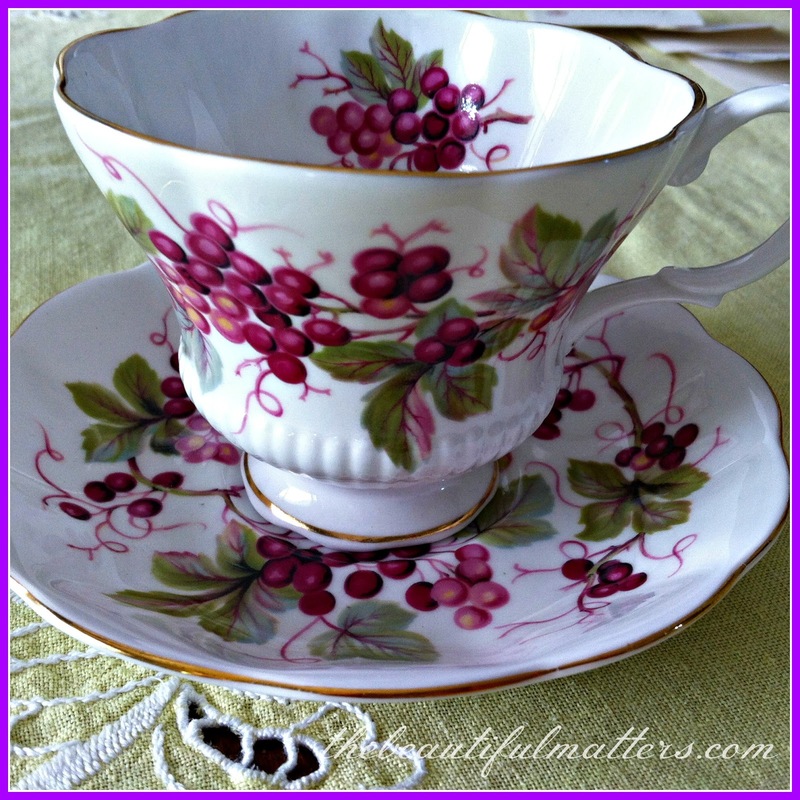 . .
Today I had a cup of tea in my new teacup, a Royal Albert, found during my recent visit to the antique store. No snack today, because look what's for dessert tonight . . . a yummy homemade carrot cake in honor of our youngest's 21st birthday. My daughter made a delicious breakfast in honor of Mother's Day and her brother's birthday. 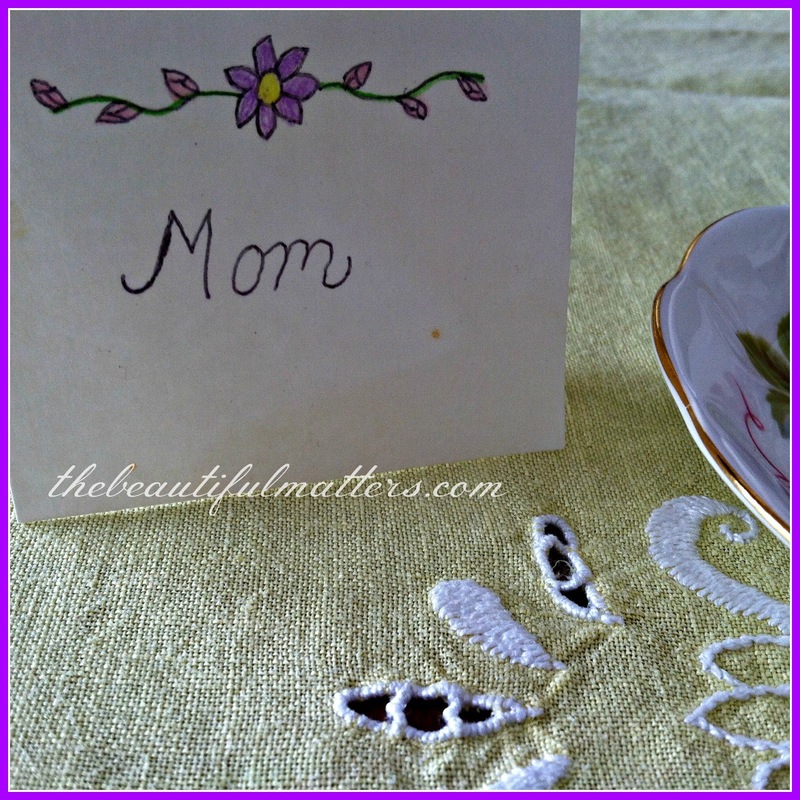 She set the table with placecards she made when she was 12. My husband got me some beautiful flowers . . . I am so grateful to be a mom. There was a time when I doubted I'd ever have children. We lost seven babies in the process of having our three, including a little boy who lived just a day. We lost four before our daughter, and three after, before having our two boys. Back then, Mother's Day was extremely painful for me. Now it is a day of humble gratitude. A friend once remarked that I treated my children as if they were treasures. And, of course, they are, as are all children. 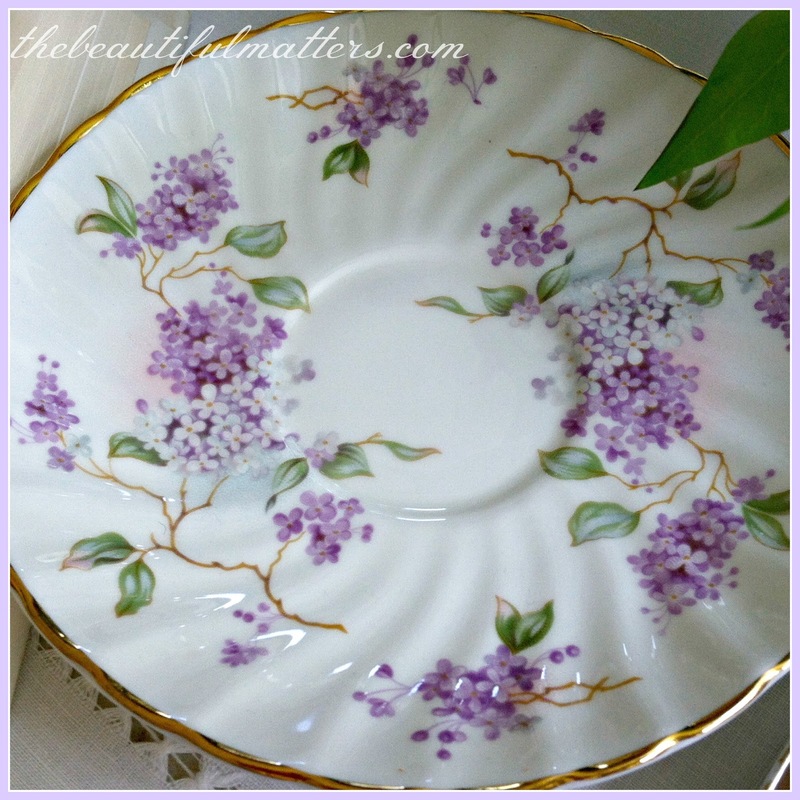 Went to my favorite antique and craft mall this past week, and found loads and loads of goodies, as usual. I got excited by about ten times as many things as I actually brought home; I had to whittle my wish list down a little. I will share them all eventually, but today I want to show you this piece. I really want to take this apart. 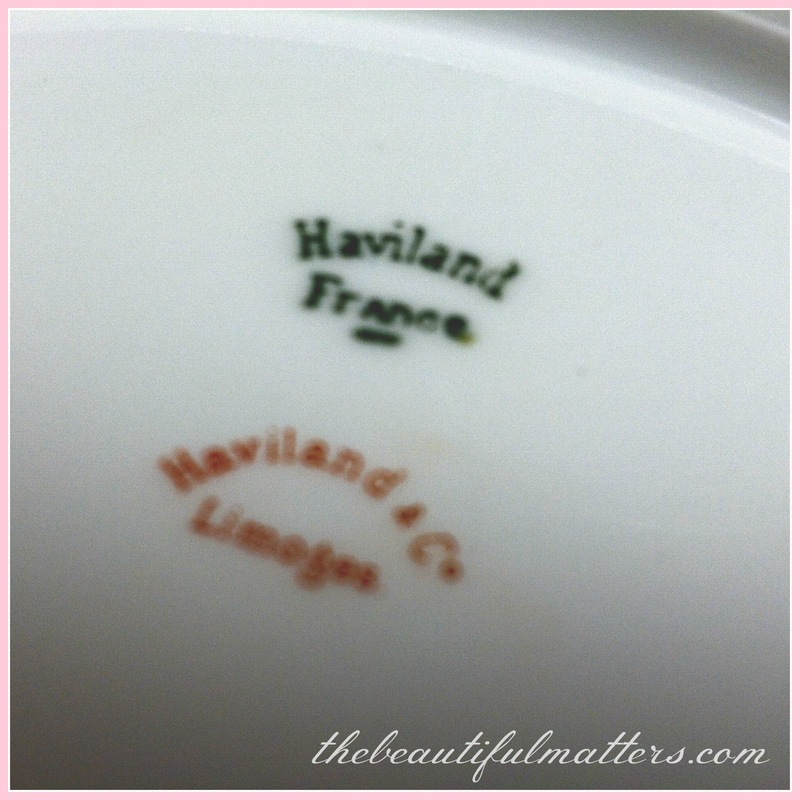 The two bottom plates are Haviland Limoges. Beautiful! 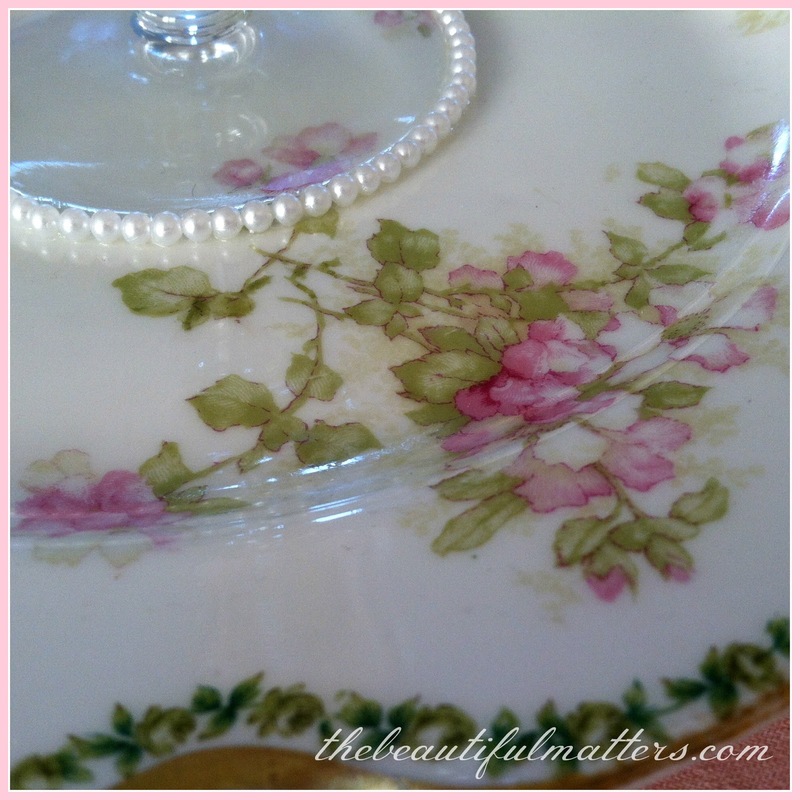 The faux pearls were a nice idea, but I don't like how they look next to the beautiful vintage china. Plus, the two glasses are not aligned with each other. I have no idea whether I can get this apart without hurting the plates, but several Google searches have revealed that pure acetone will work to dissolve the glue. 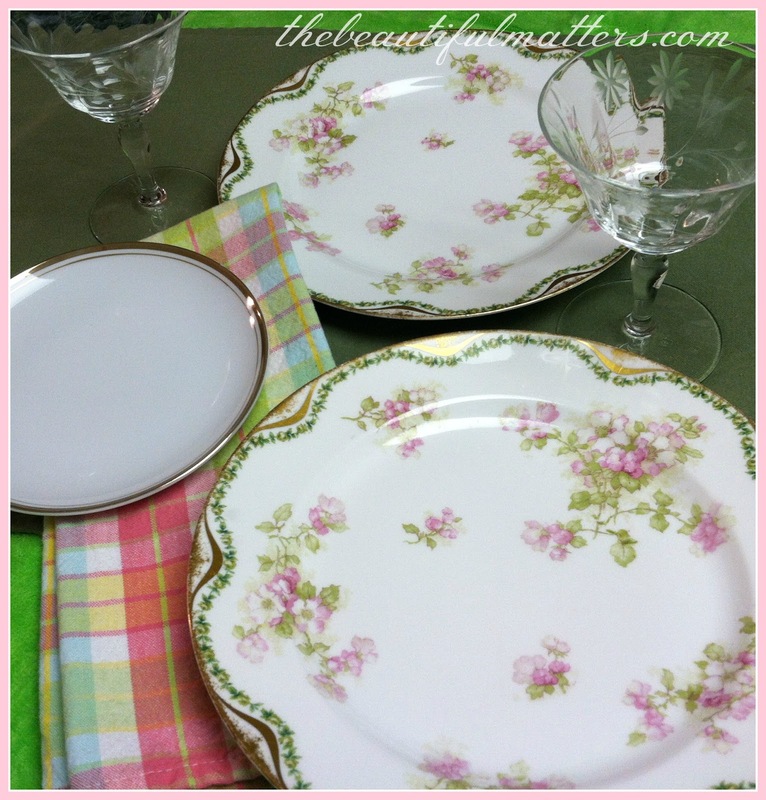 I am a little worried that I will break something, or remove some of the glaze on the plates. 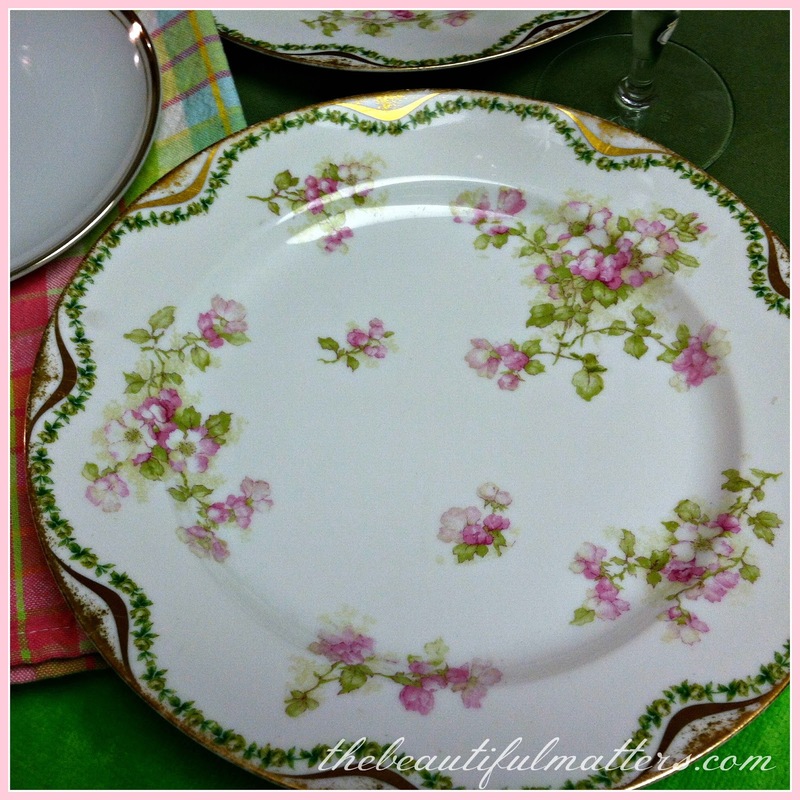 I just really want the plates, and if I can rescue them, I will have scored a really good deal. Guess what? They came apart in water! Yes, water. I read that Super Glue is not recommended for glass; it won't bond well. I have no idea if this crafter used Super Glue to glue the plates to the glasses, but I thought I'd try soaking the whole thing in water. And the two glasses aren't too shabby, either. I was able to get the whole thing apart with nary a chip. 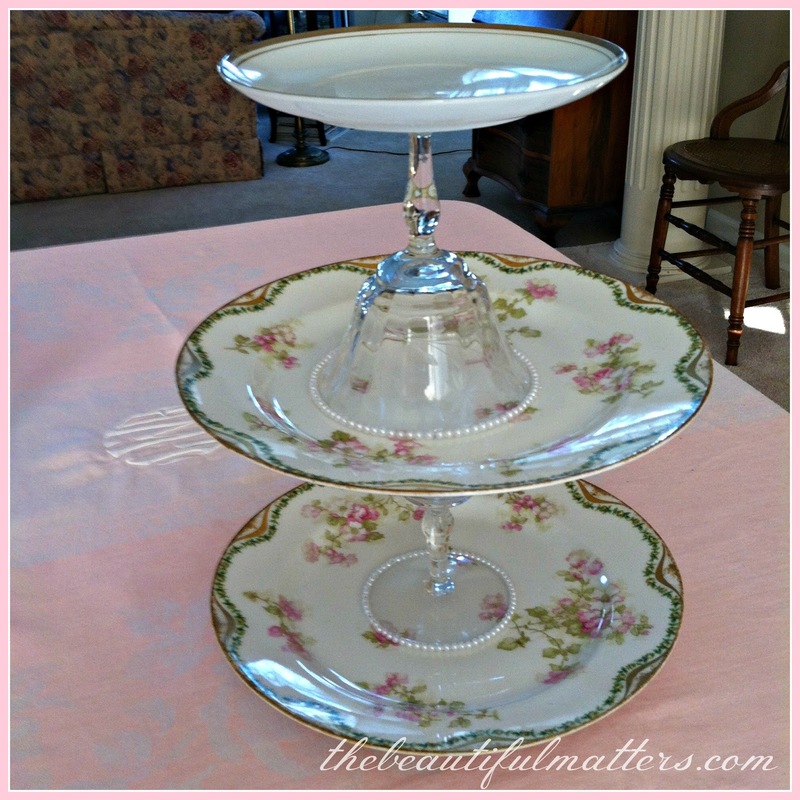 What if I'd wanted to keep the whole set-up, had filled it with little sandwiches and scones for a tea party, and then washed it? It might have fallen apart during washing and ended up in pieces in my sink.